"Notebook-Killer" Vol. 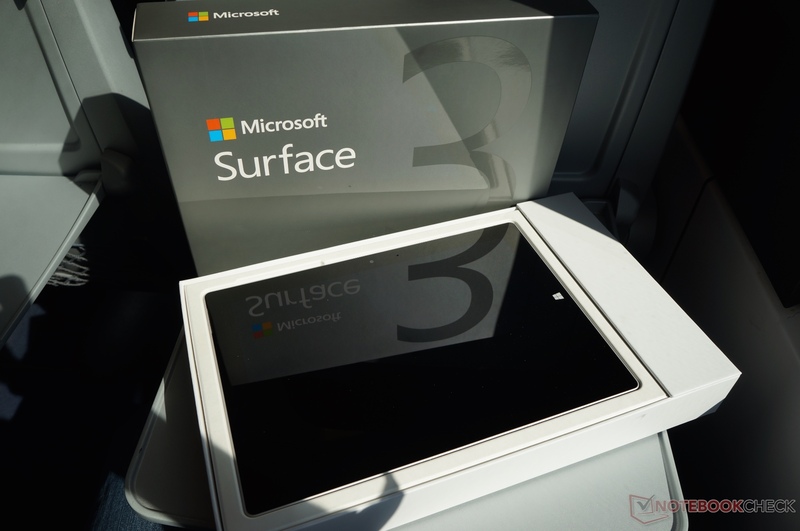 3 - After the Surface Pro 3 was released last autumn, Microsoft now also launches the light version called Surface 3. 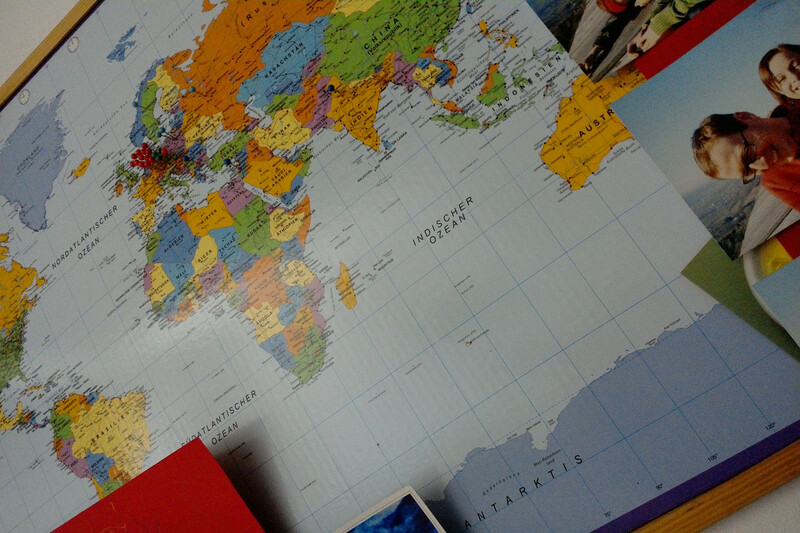 We already have a review unit and will publish our first results. Update 05/07/2015: Application Performance, Emissions and Rating. 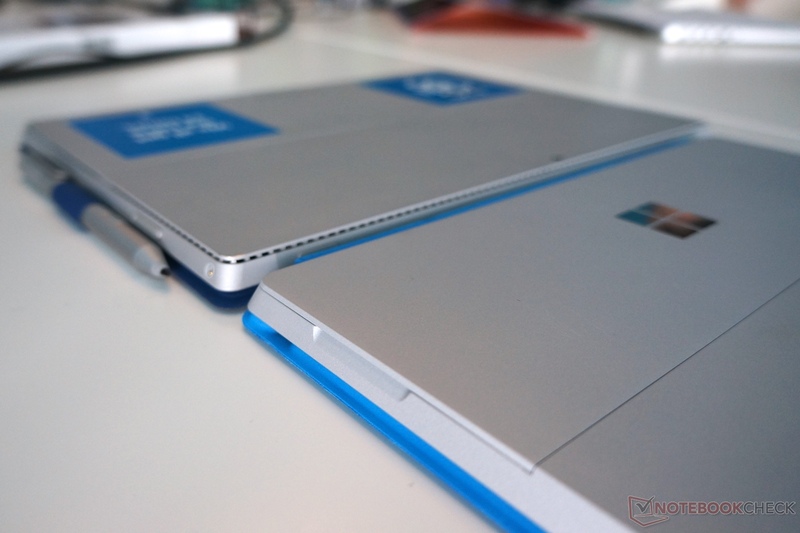 Microsoft's search for the next generation of notebooks continues. 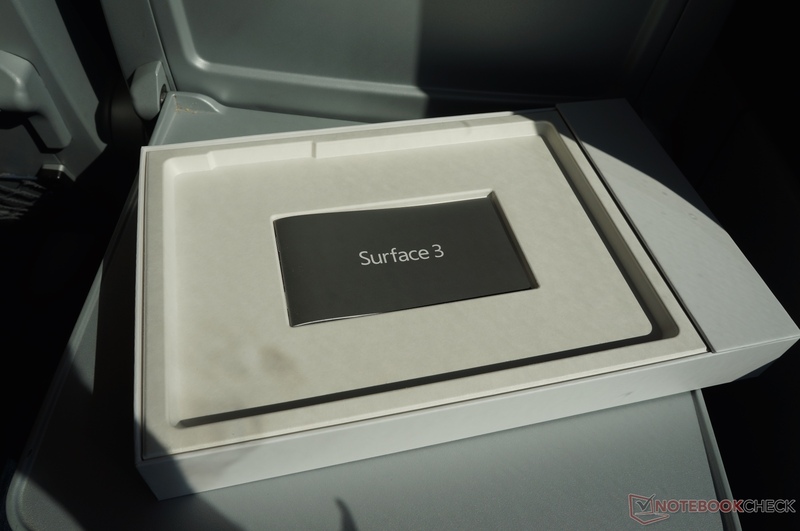 Panos Panay, Corporate Vice President for Surface Computing, already announced the Surface 3 on March 31st on Microsoft's Surface Blog. 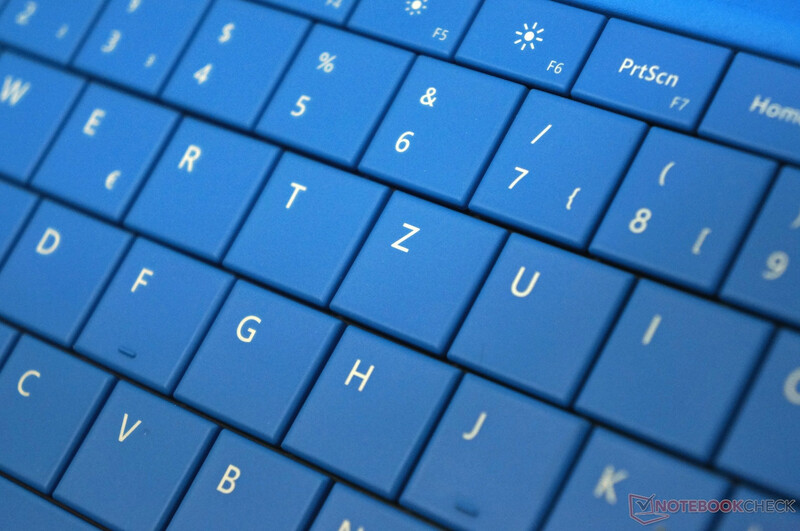 The most important change compared to the predecessors Surface 2 (here in review) and Surface RT is that you get a full version of Windows 8.1 this time. Microsoft does not want to comment on the future of Windows RT, but insiders think this will be the end of Windows RT. 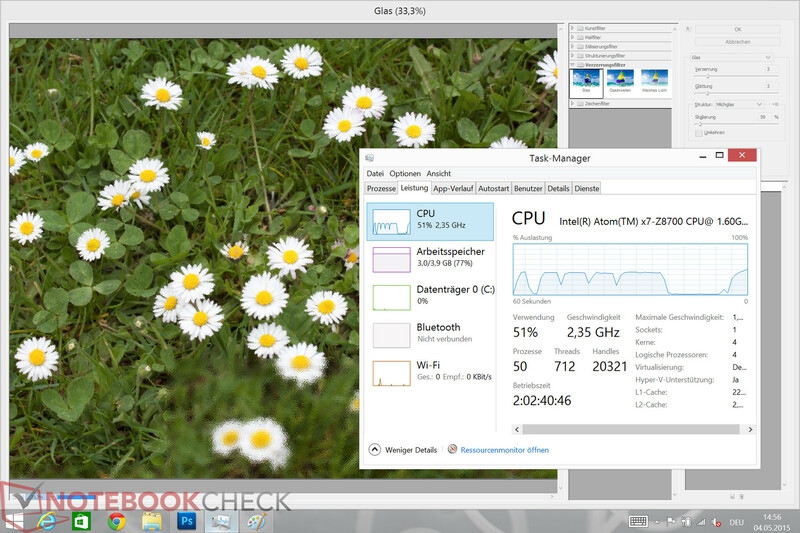 The use of Windows 8.1 is possible thanks to the integration of a CPU with x86 support. 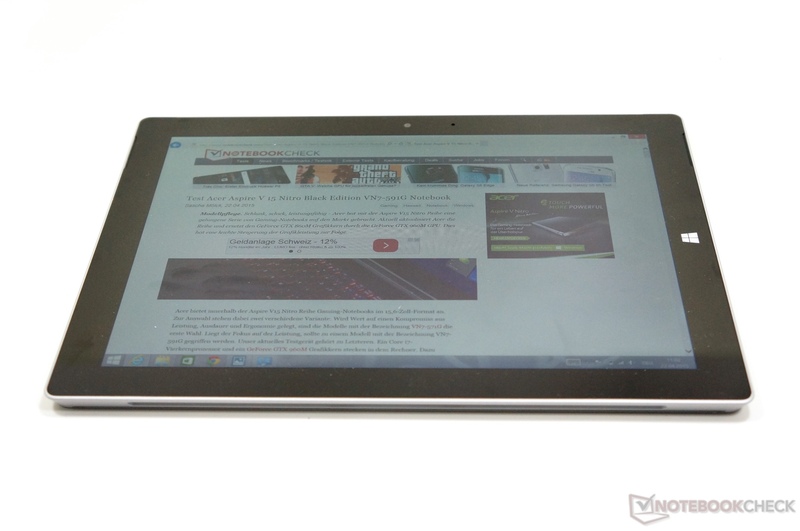 The Intel Atom x7-Z8700 is based on the brand-new Atom generation and is manufactured in a 14 nm process. The chip of the Cherry Trail platform has four cores and runs with 1.6 up to 2.4 GHz. 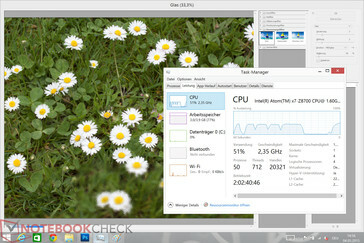 The GPU performance is supposed to be twice as high compared to the Bay Trail platform. 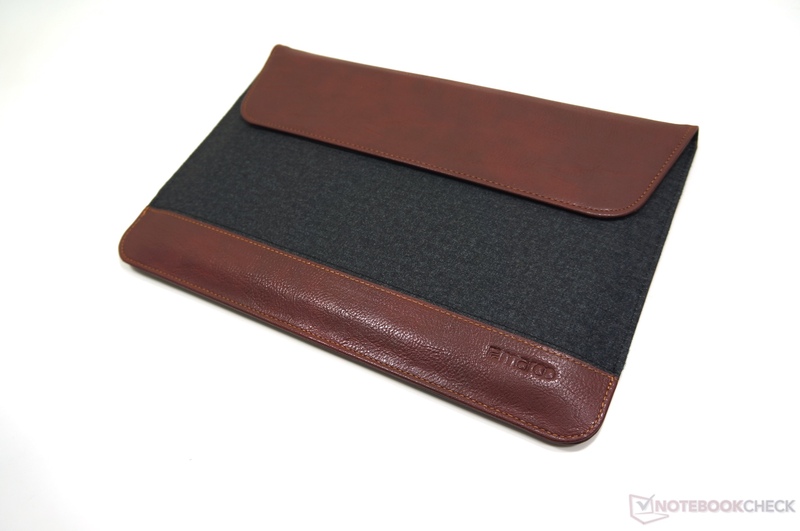 The following article includes our first test results and impressions of the device. 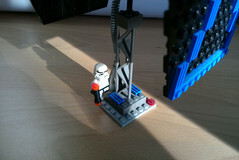 The review will be complemented with further measurements and content in the next couple of days. Microsoft's Surface 3 is targeting price-conscious customers with a starting price of 599 Euros (~$648), which is 200 Euros (~$216) lower than the Surface Pro 3 (here in review) with an Intel i5 CPU and 150 Euros (~$162) lower than the version with the Core i3 (including input pen), respectively. 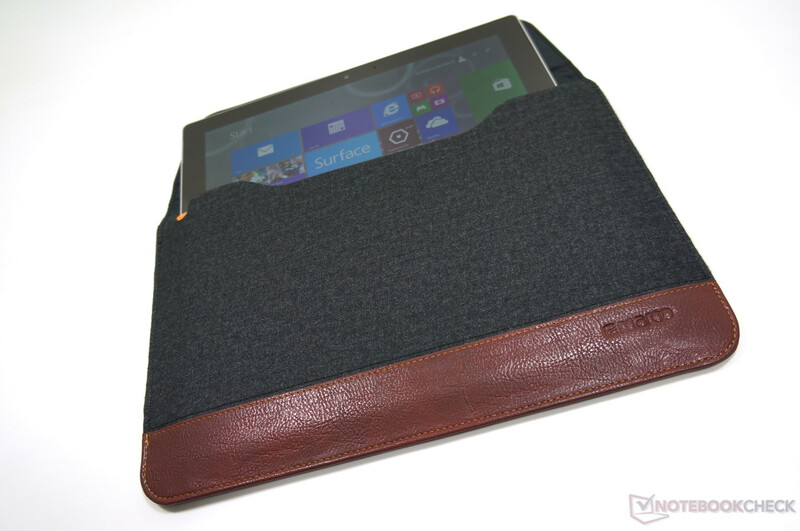 According to Microsoft, the device is designed for university students, parents and mobile employees. 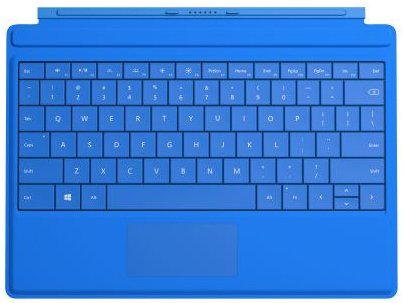 Select the base configuration with 64 GB storage and 2 GB memory, add a Type Cover since you want to be able to type comfortably, and you will quickly have a total price of around 749 Euros (~$810). 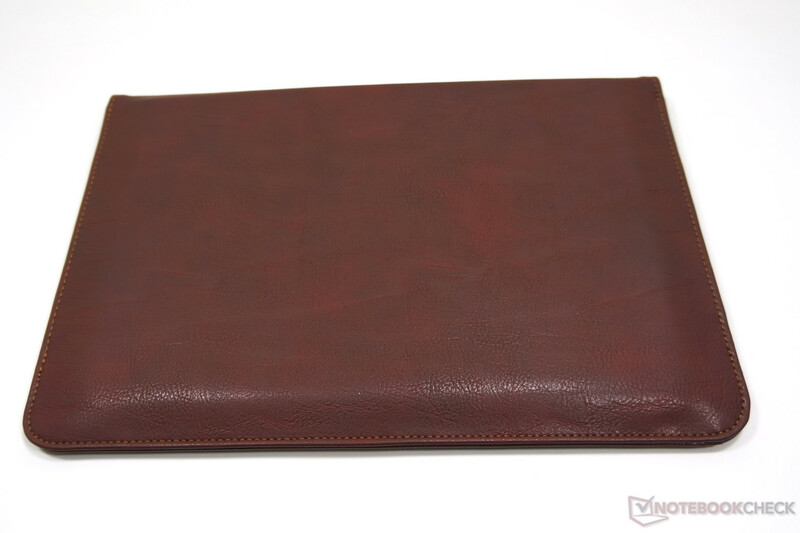 This price range already includes numerous notebooks that are clearly superior to the Surface 3 in respect of performance reserves and storage capacity. 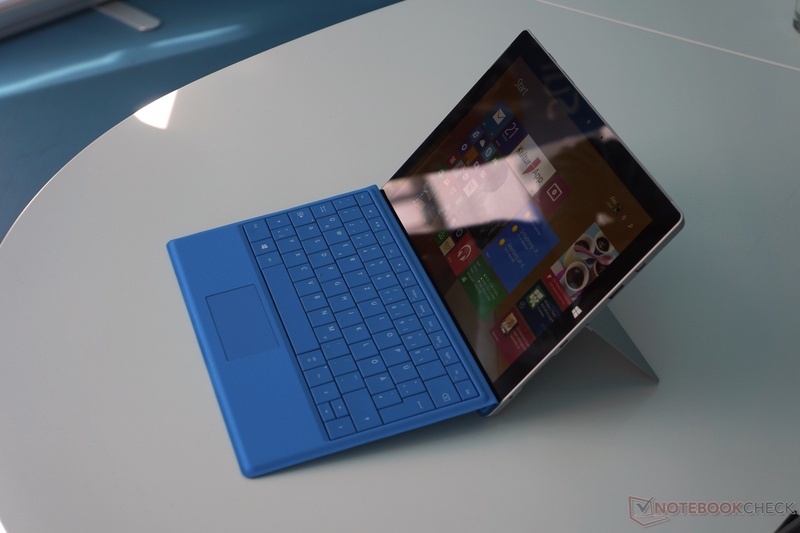 But the Surface 3 can score with its high mobility. Office 365 Personal is also included, but only for one year. After that you will have to pay 69 Euros (~$74), every year. By the way: The 64 GB/Wi-Fi version of the Apple iPad Air 2 costs 589 Euros (~$637); with Smart Cover (39 Euros, ~$42) and Wireless Keyboard (69 Euros, ~$74) you get a comparable package for around 697 Euros (~$754). 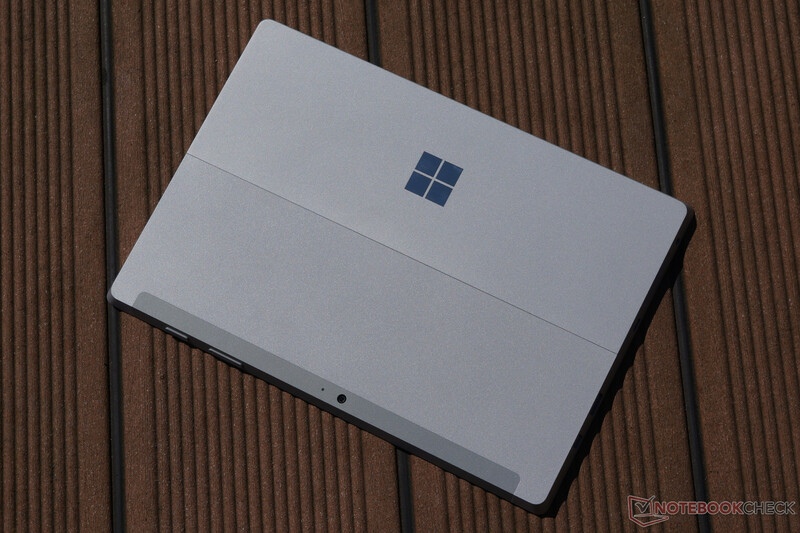 Besides the versions with 64 and 128 GB storage, which are available first, Microsoft will also sell a special Business version with the same two storage capacities, but always with 4 GB memory and Windows 8.1 Pro. 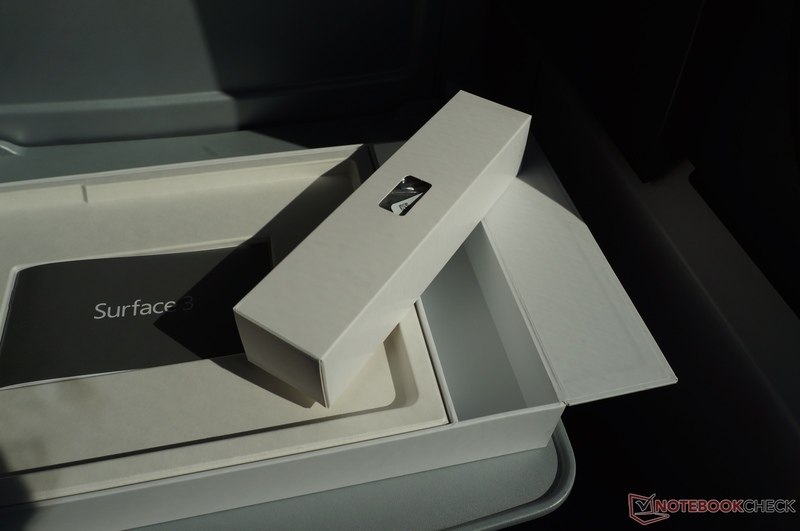 There will also be a special Education version in the beginning of May with 32 GB storage and 2 GB memory. The bundle will also include the optional Type Cover and the input pen for a total price of 579 Euros (~$626). Our review unit is equipped with 128 GB, and 93.2 GB of the 110 GB was free at the start of the review. This would mean that you can only use a couple of GB for your own files when you get the configuration with a 32 GB SSD. The overall impression after the first few hours with the device was very positive. 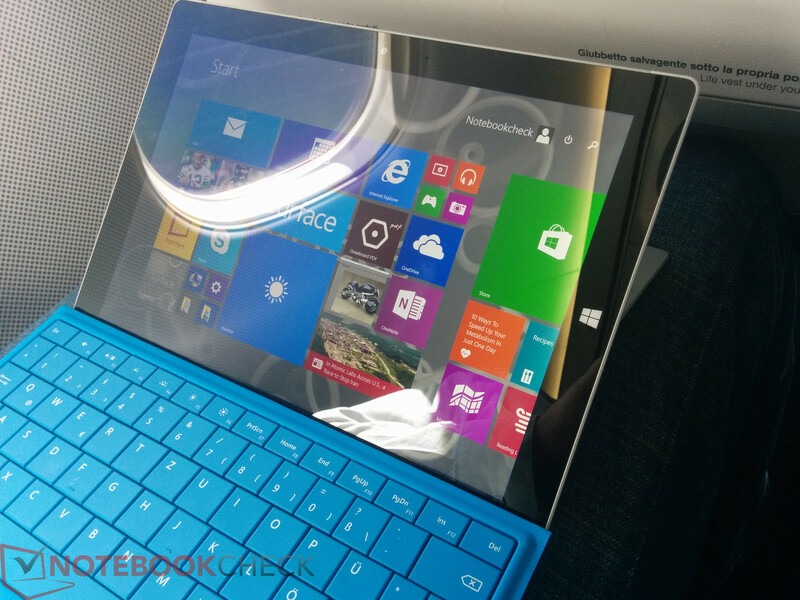 The design and the feel of the Surface 3 are similar to its predecessors. The magnesium chassis appears sophisticated, but it is also a bit dull. 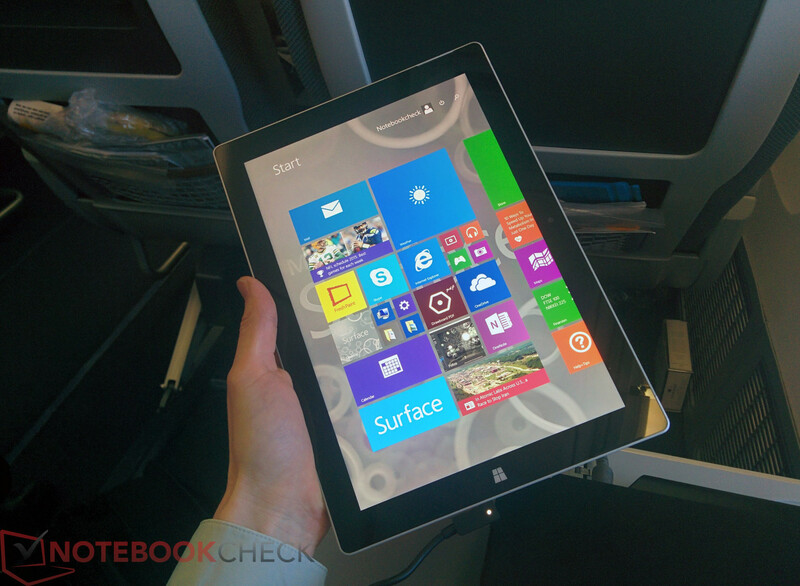 With a weight of 622 grams (without cover), the Surface 3 is pretty heavy in the hands after a while. 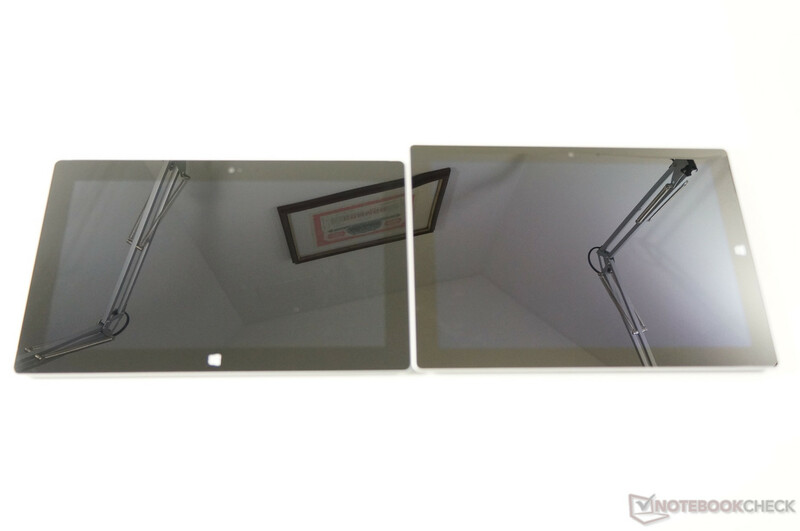 Apple's iPad Air 2 only weighs 437 grams. 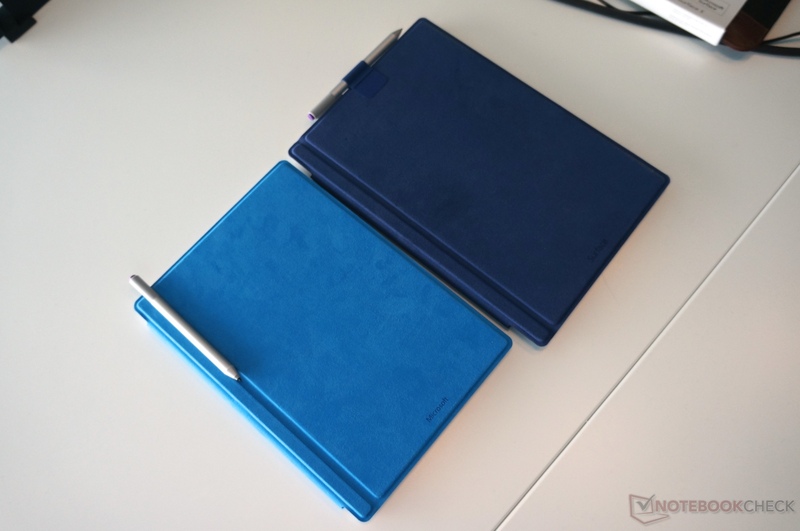 The thickness of 8.7 mm is lower compared to the bigger sibling Surface Pro 3 (9 millimeters), but it is still noticeably thicker than the Apple iPad Air with just 6.1 millimeters. We like the silent operation of the device (no fan). At the same time we could not determine any performance problems with simple office tasks and Internet applications. The display can subjectively convince with a good luminance and rich colors. The Type Cover also works pretty well and the typing experience in our first tests is a bit better than you would expect from such a solution. 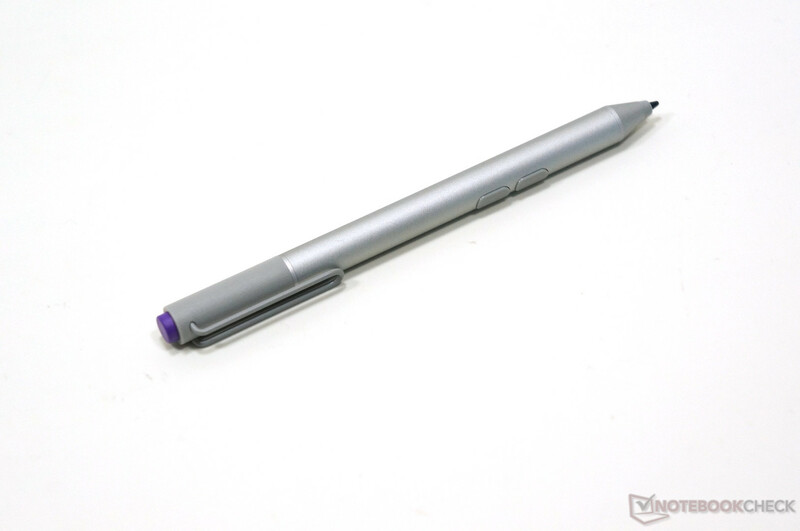 We reviewed the optional input pen as well, which shows a good and precise response. 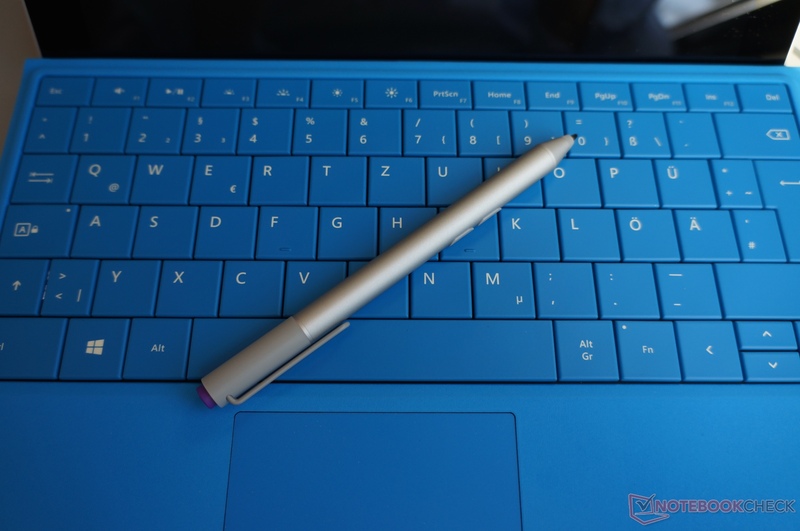 The pen is similar to the model of the Surface Pro 3. The active pen with N-trig technology has a noticeable weight because of the necessary battery, but it is certainly not inconvenient. 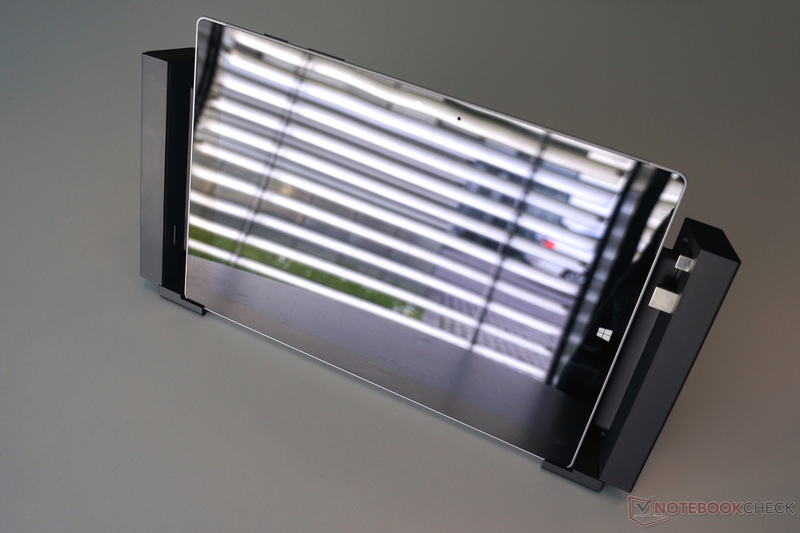 The stand mechanism at the back now supports three positions, so the adjustability of the Surface 3 to certain situations or preferences is better than before. However, the solution still has the same issues on soft and uneven surfaces, respectively. 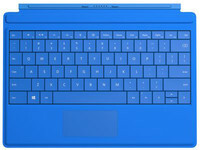 We also want to mention that Microsoft does not want the user to upgrade or maintain the device. 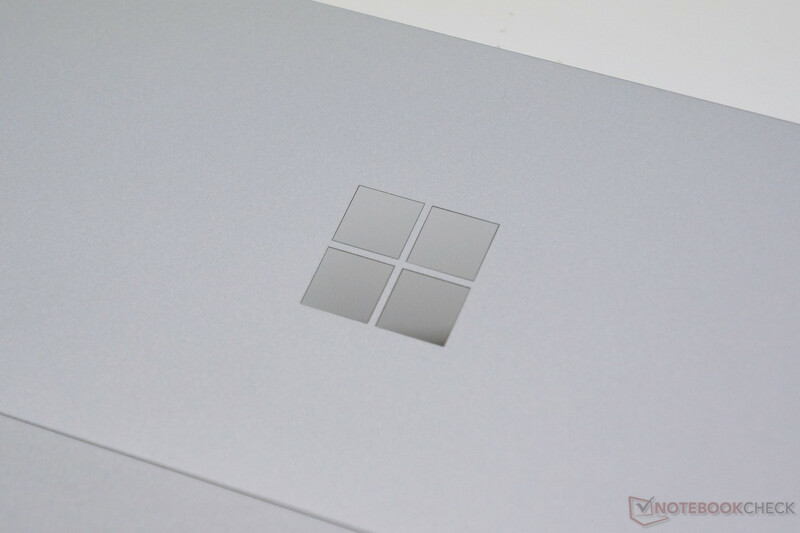 If the device is defective, you will get a new device in return for your credit card information according to Microsoft, after that you have to return the defective device. If that is not the case, Microsoft will charge your credit card. This solution does at least reduce the time where you cannot use the device. 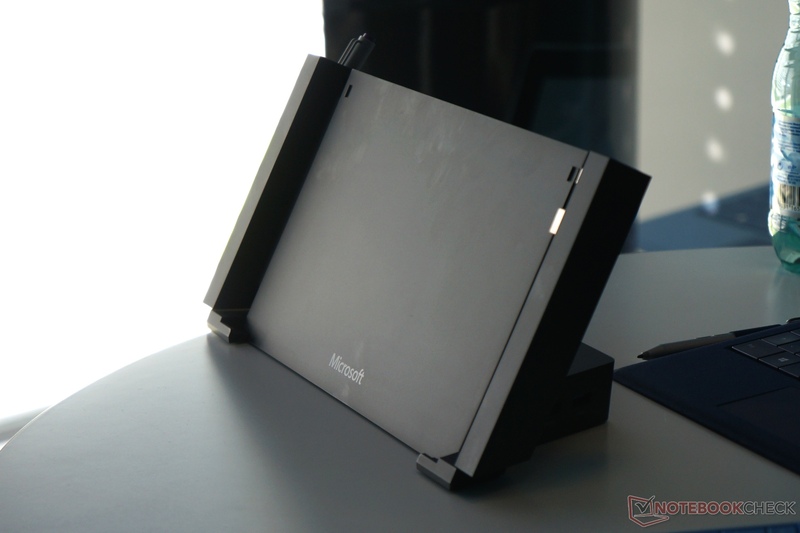 Our first sound check shows that the sound quality of the Surface 3 is good for a tablet and the maximum volume is sufficient (was improved compared to the Surface Pro 3 according to Microsoft) for a small room. 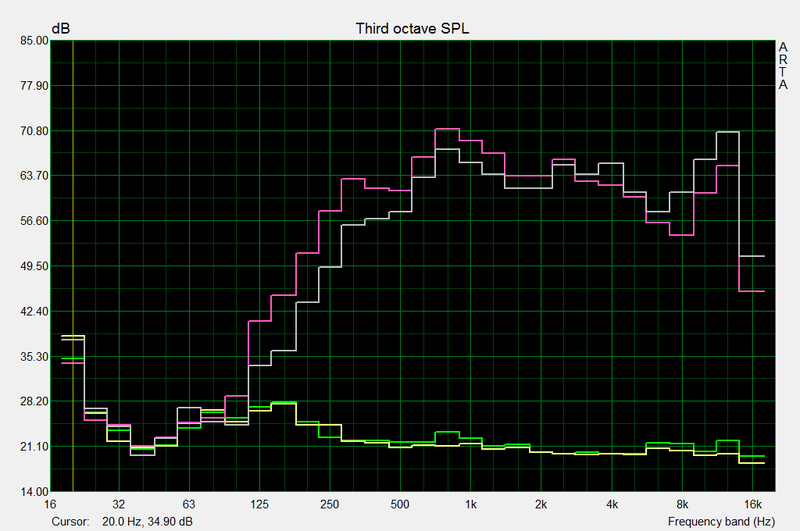 You will, however, also notice the weak bass with some music titles and some echoes during music playback. The integrated camera module puts up a decent performance as well. 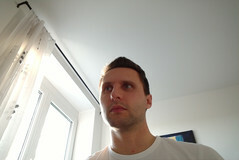 The rear camera can actually be used for occasional snapshots, while the webcam is sufficient for simple video conferences. 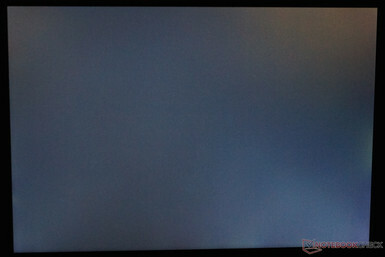 We can see problems in low-light situations, which will result in significant picture noise. 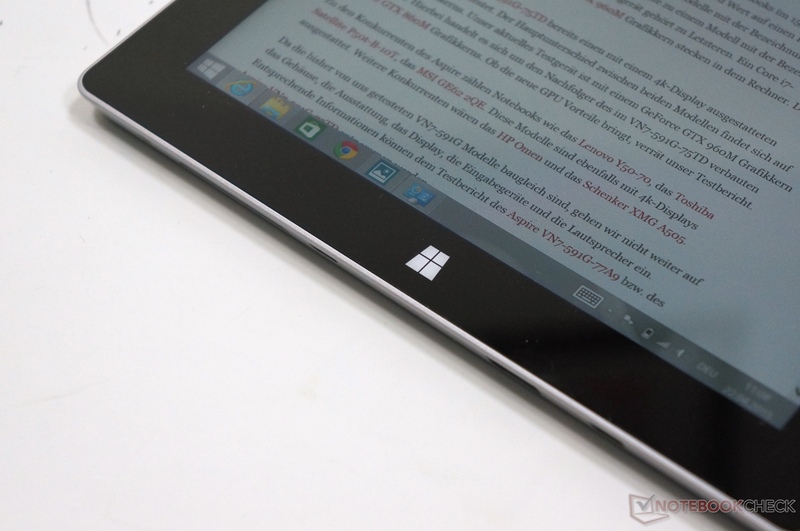 The Surface 3 has a touchscreen in the unusual 3:2 aspect ratio with a resolution of 1920x1280 pixels. The glossy surface does ensure a good handling of the touchscreen, but it will result in inconvenient reflections when you use the device outdoors or when the lighting situation is unfavorable. 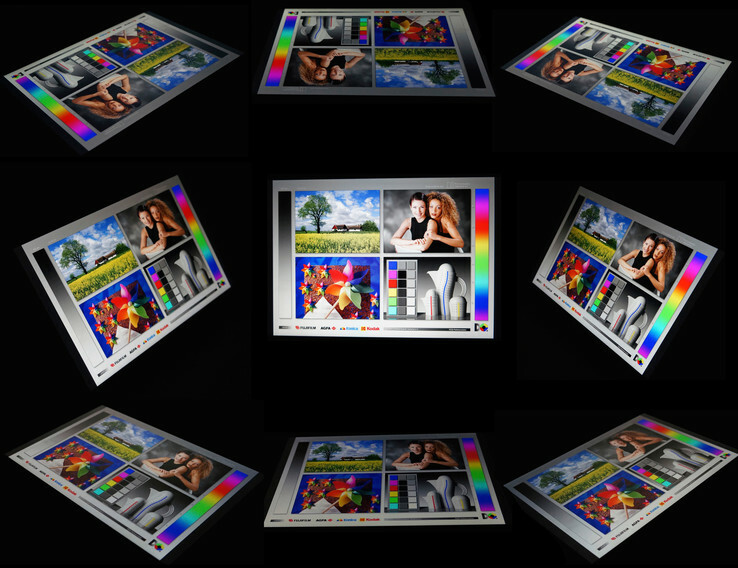 The very high luminance of up to 400 cd/m² helps to reduce reflections indoors. 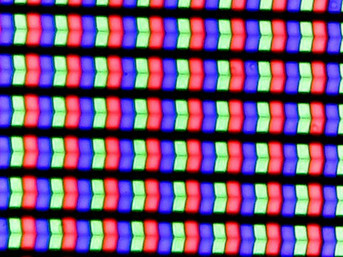 The brightness distribution of the small screen is great and we can hardly see any screen bleeding of the LED backlight illumination, even in dark environments. The minimum brightness with a white background is very low at 4.7 cd/m², so the tablet should also be well suited for reading in the dark. 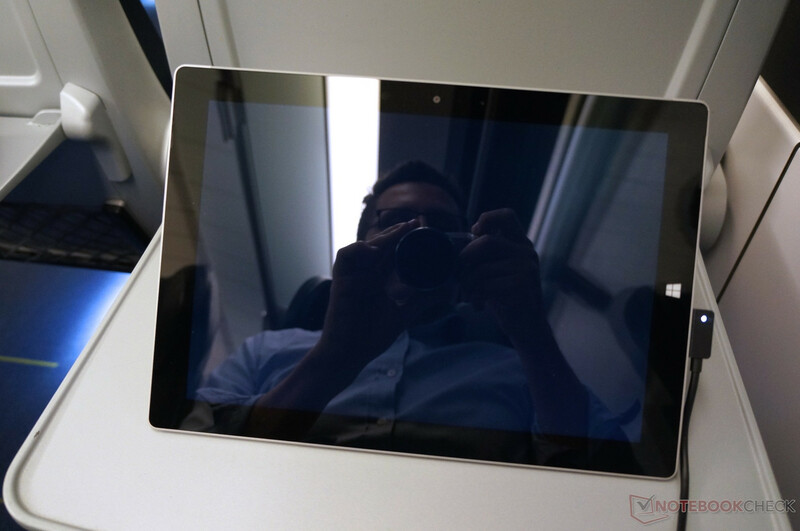 Thanks to the good brightness, the Surface 3 can compensate for some reflections but not prevent them completely. 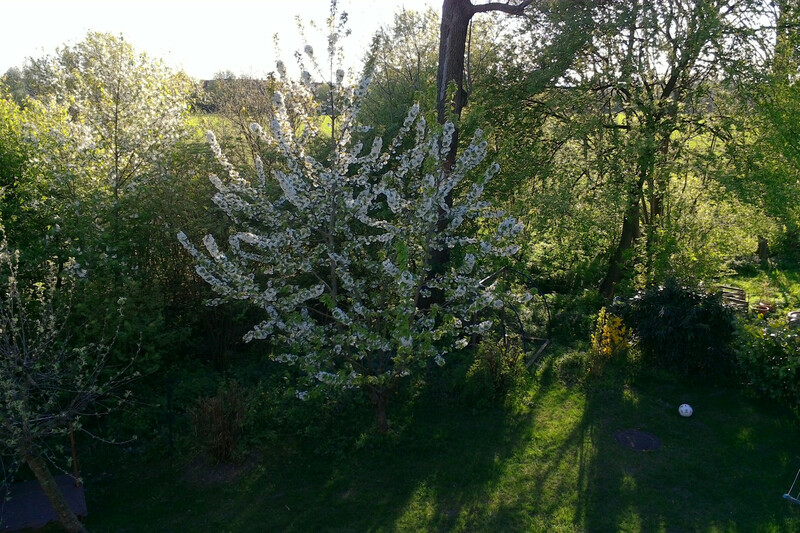 The maximum brightness is sufficient to see details without a direct light source. Both the black value (0.49 cd/m²) and the maximum contrast (814:1) are okay, but they are pretty average in the tablet segment. 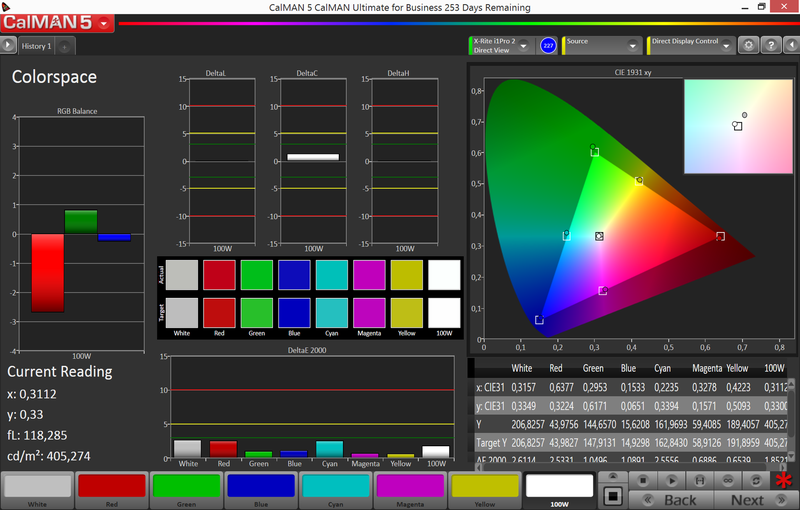 The display uses the pulse width modulation (PWM) to control the brightness, but our measurement tools only notice it in the lowest 2-3 brightness levels. The light sensor was pretty annoying at first because it does not allow manual control when you want a brighter picture, but it can be deactivated in the Windows energy settings. 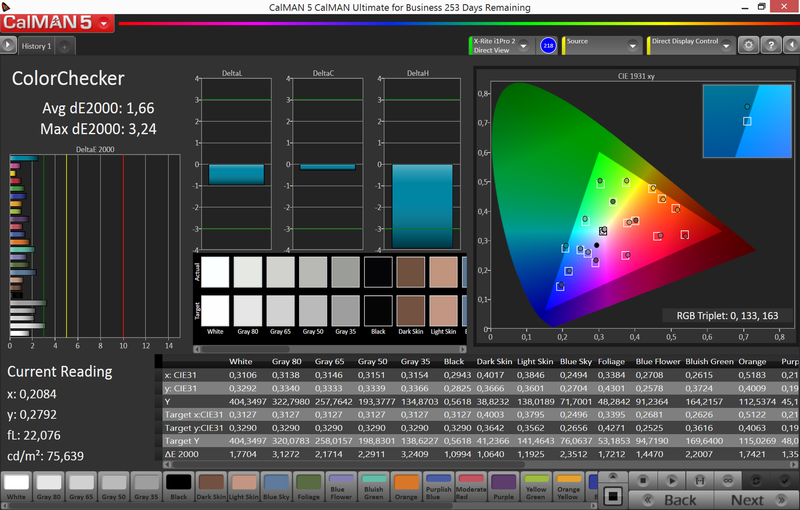 A surprise is the analysis of the color accuracy. Compared to the sRGB reference color space, the Surface 3 already shows very small average deviations (DeltaE) of just 1.66 for the ColorChecker and 2.75 for the grayscale ex-works. A calibration can further improve the very good results to 0.86 (ColorChecker) and 1.06 (grayscale). Graphic artists and picture editors should be very happy with these results. 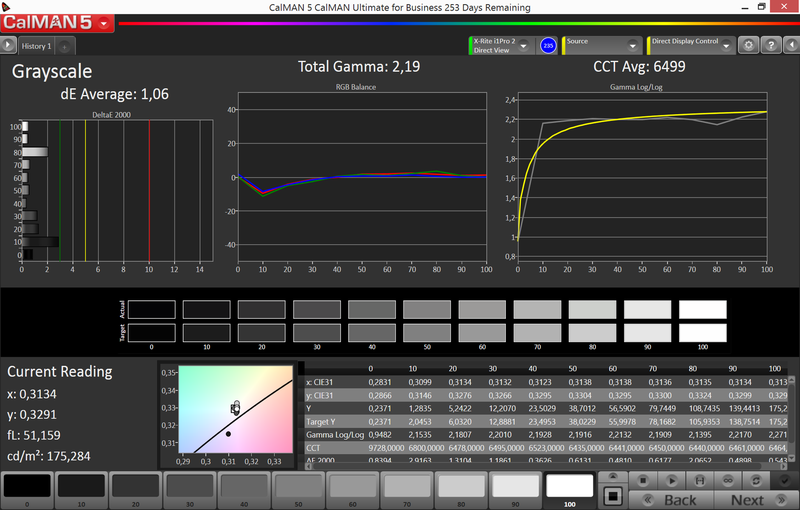 No suprise after the very good Calman results is the color space test against sRGB and AdobeRGB1998. sRGB is covered by very good 98.8% and AdobeRGB1998 by 64.4%. 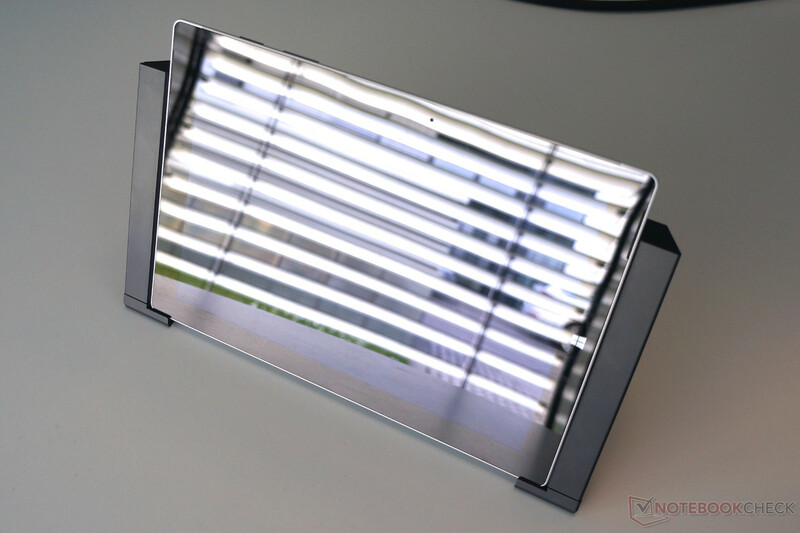 The viewing stability is – as expected for a display based on the IPS technology – very good and is only affected by the annoying reflections with very flat angles in practice. An important aspect for the concept of the Surface 3 is the silent operation as a tablet, which requires a passively cooled x86-CPU. 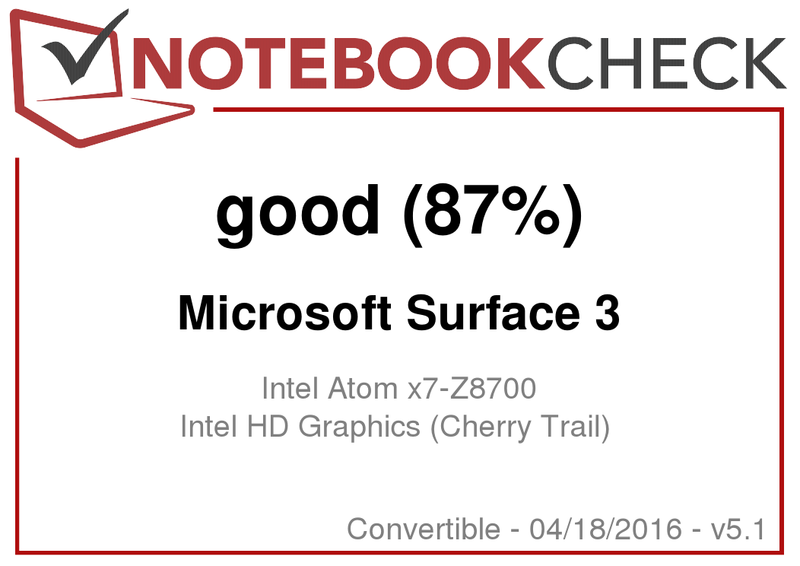 Microsoft decided to use the recently announced Intel Atom x7-Z8700 CPU, one of the first chips from the new Cherry Trail platform. The quad-core is manufactured in a 14 nm process and has a TDP of under 4 Watts. The first test for the CPU performance shows that the new Intel Atom x7-Z8700 CPU is slightly faster than the Z3795, which is the current top version of the Intel Atom Bay Trail generation (22 nm). The Core i3-4020Y in the base configuration of the Surface 3 Pro has a clear advantage in the single-thread tests, while the Z8700 is actually often on par in the multi-thread tests. You can also clearly see the performance advantage of the i5-4300U CPU in the Surface Pro 3. 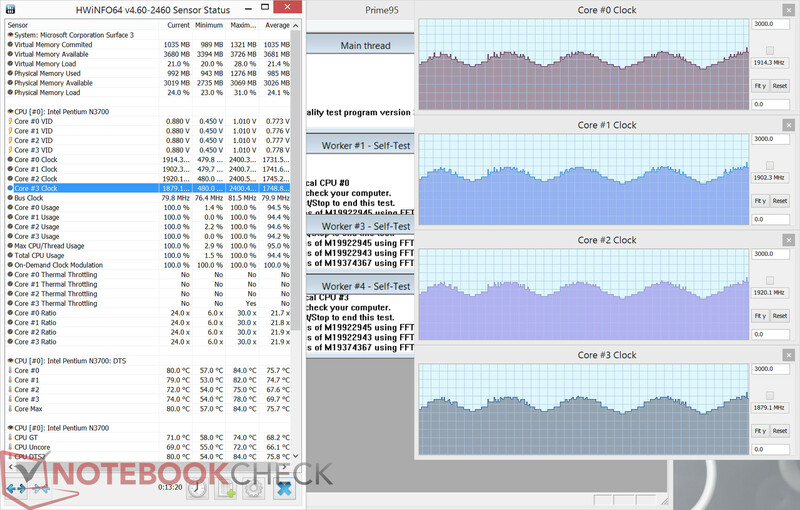 The four cores of the Z8700 CPU usually run with 479 MHz while idling with small spikes to 800 MHz. 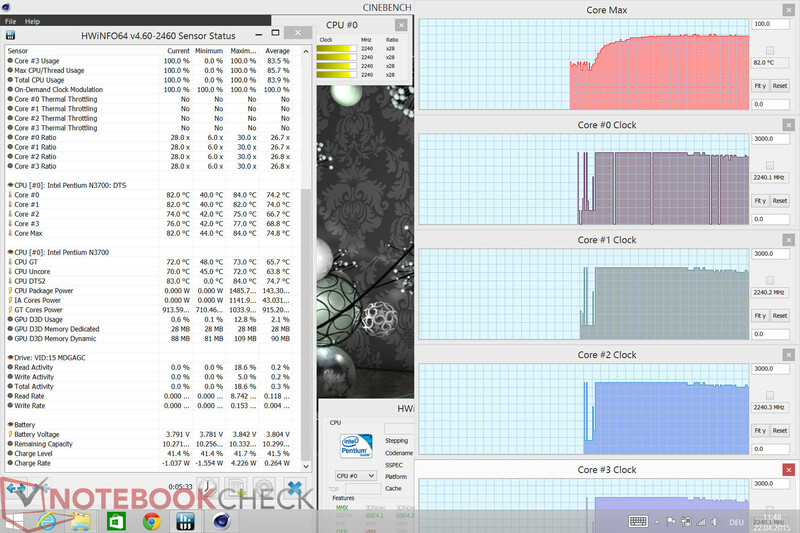 All four cores manage 2.4 GHz under load in the Cinebench multi-thread test. The chip temperature according to HWiNFO reaches a maximum value of 82 °C after a couple of minutes and then levels off at this value. We can see a slight clock reduction to 2.2 - 2.3 GHz after a few minutes and the back of the tablet warmed up to 39 °C in the area under the camera. This should be the location of the CPU. 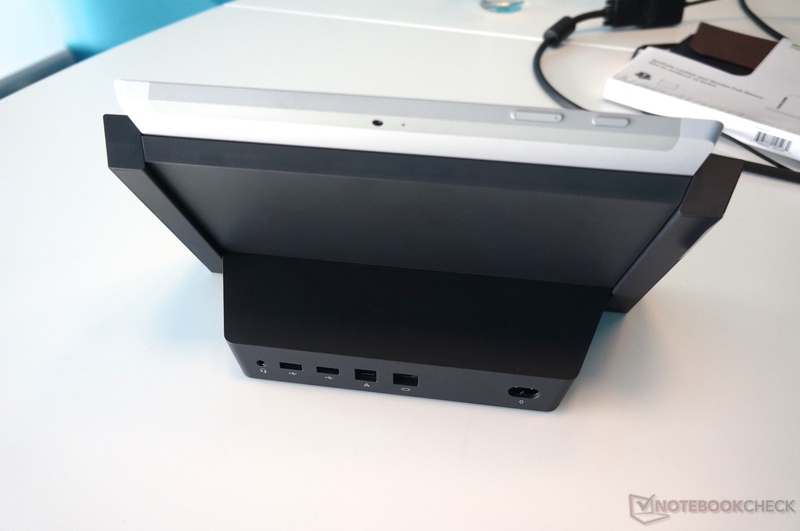 We can also notice this hotspot at the front, but the surface stays a bit cooler. 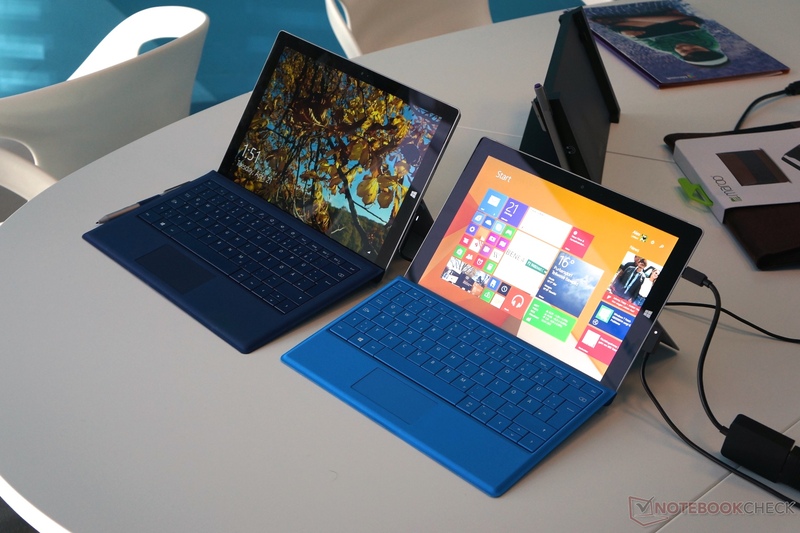 The Surface 3 is available with two different storage solutions at the moment. A 64 GB drive or a 128 GB drive, which is being used in our review unit. Contrary to faster Solid State Drives, the manufacturer only uses eMMC (embedded Multimedia Card), where the technology and the performance are closer to an SD card. The advantage is the lower price for the manufacturer, but the drawback is the performance for the user. Another reason for the choice of the eMMC solution could also be the missing compatibility of the new Cherry Trail Atom processors. The Bay Trail predecessor already had the same problem. 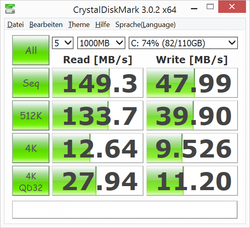 We use CrystalDiskMark to check the performance of the integrated storage solution. 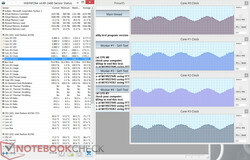 Other benchmarks like AS SSD did not work because of the incompatibility with eMMC solutions. 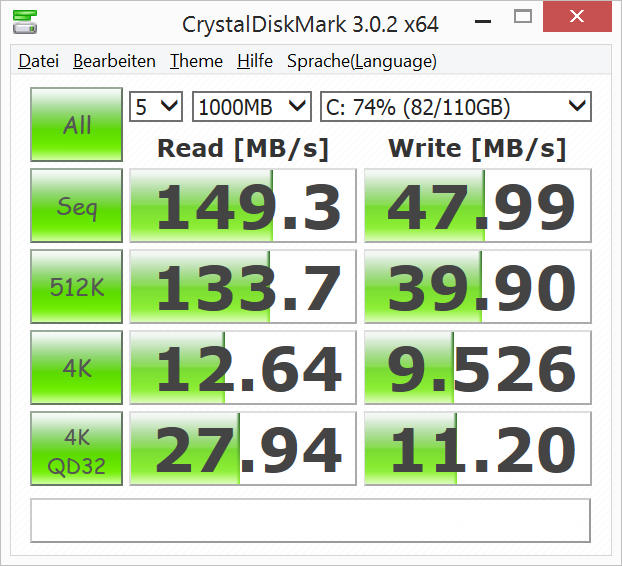 If we compare the results with the Surface Pro 3, which uses conventional SSDs, we can clearly see the big difference. 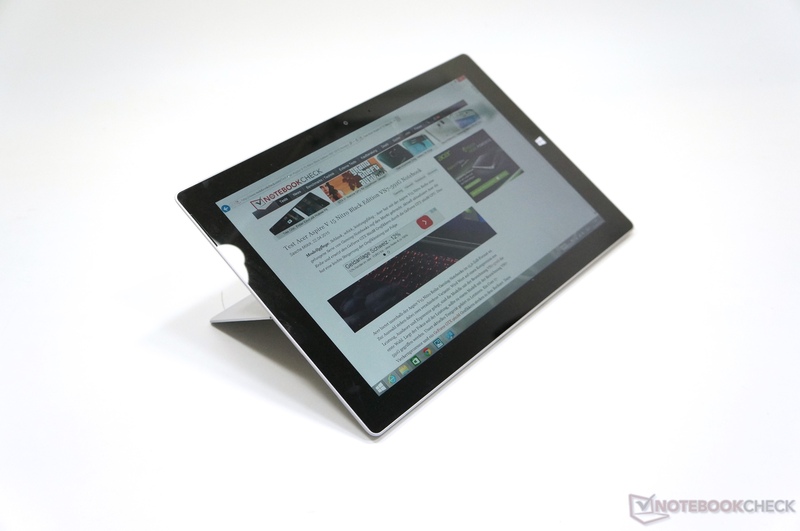 Depending on the test we are speaking about an advantage of 2x-25x over the Surface 3. 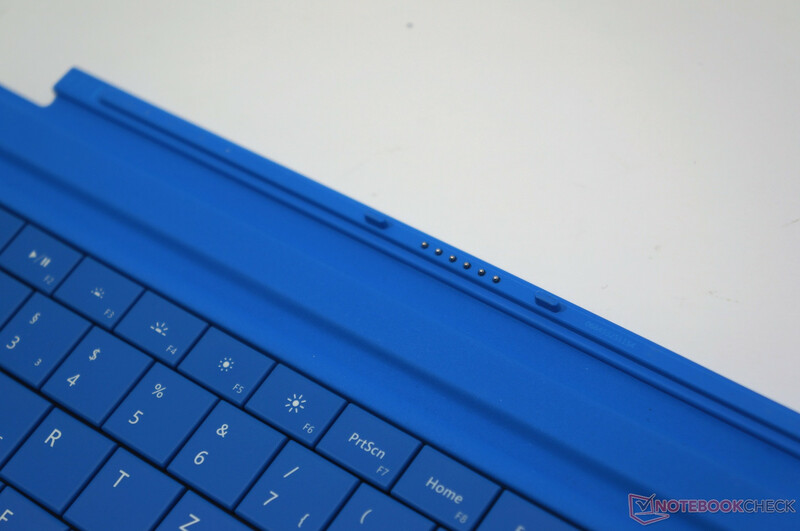 The smallest difference of the Surface 3 is in the 4K Read test, which is very important for the system start. The storage solution even falls behind an SSHD drive (Thinkpad Yoga 12) when you write large files, for example, copy audio or video files. So how does that affect the daily use? Starting the system takes around 18 seconds, but the Surface 3 almost immediately resumes from standby. There can be limitations when you copy files. For comparison: A 2 GB video file needs around 70 seconds, a folder with 10 video files (300 MB each) needs 2 minutes. If we execute the same operation on a ThinkPad X220, which is equipped with a 256 GB Samsung 840 mainstream SSD, the 2 GB video file is copied in less than 10 seconds and the folder with the video files in less than 15 seconds (vs. 120 seconds on the Surface 3!). The opening and saving of large files within applications can also result in delays that you would not expect from a device with flash storage. We will have a closer look at the performance in several scenarios (picture and video editing,...) in an upcoming update. Games and the Surface 3? 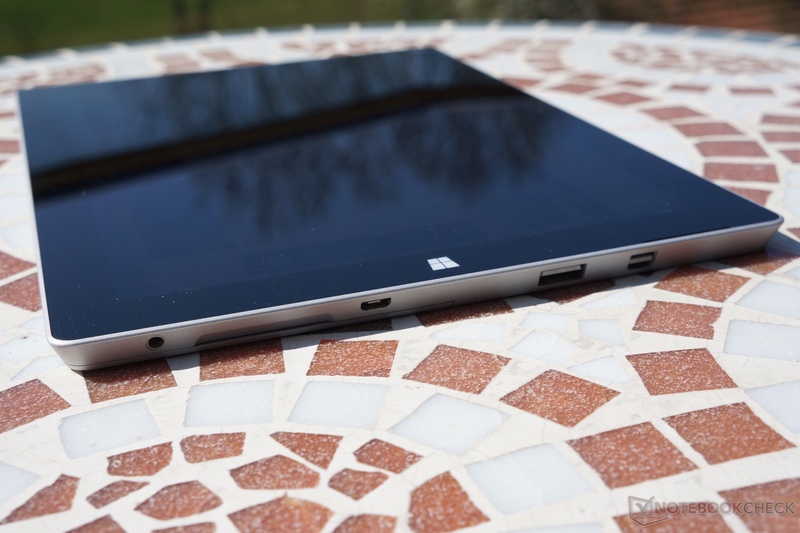 The small Atom processor inside the Surface 3 is not powerful enough for complex games. Even less demanding Windows 3D games like Team Fortress 2 can only be played in the lowest settings, despite the much improved GPU compared to older Atom processors. The frame rate in our multiplayer test often dropped below 20 fps in busy scenes, but it was subjectively still playable (see video). 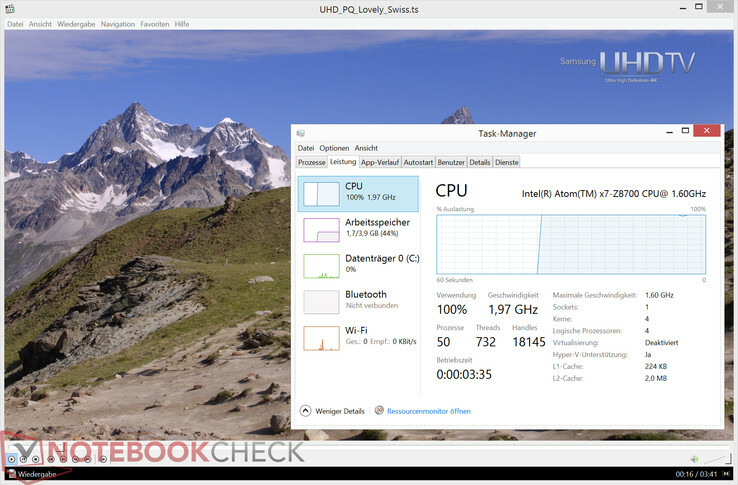 We start the evaluation of the system performance with a look at the results in the PCMark benchmark. 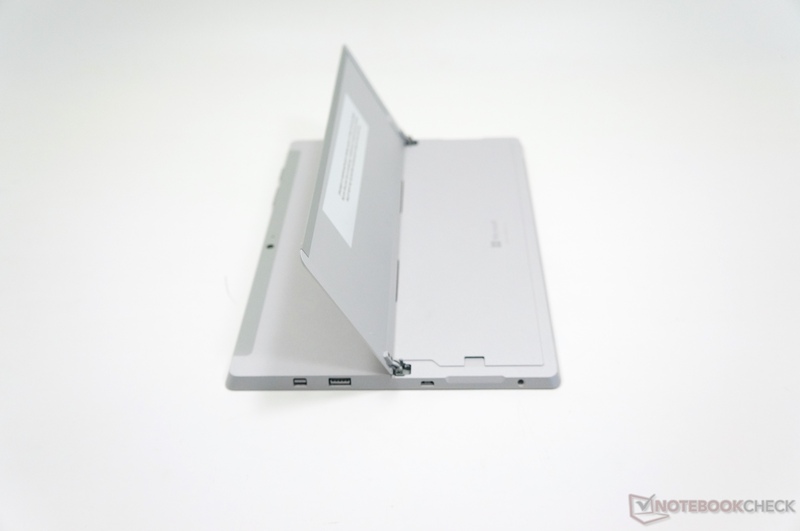 With 3029 points in PCMark 7, our review configuration is just behind the Lenovo Miix 2, which is equipped with an Intel i3-4012Y processor (active cooling!). Devices based on Bay Trail chips like the Aspire Switch 10 or Venue 10, for example, fall behind by 20-25 % in this test. 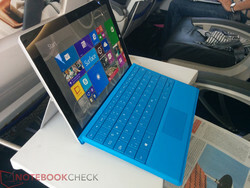 Microsoft’s Surface 3 Pro (i5-4300U, 128 GB SSD) has a significant advantage and is around 70 % faster than its smaller sibling. 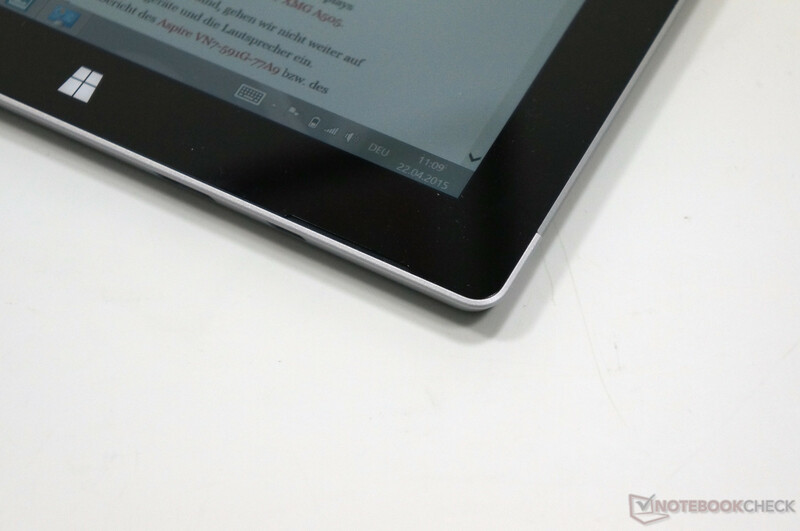 The Surface 3 can beat the Miix 2 in PCMark 8, even though the device from Lenovo is equipped with a faster SSD. Intel’s Haswell chip i5-4202Y in the Aspire Switch 11 is roughly 20 % faster, and the Venue 11 with the Broadwell M-5Y10a is around 50 % faster in this test. We open 10 RAW pictures (around 20 MB each) and use different tools. The opening of the pictures takes a couple of seconds each. Crop commands are executed immediately, picture corrections like exposure, color and brightness are just as quick, but the corresponding preview is showed with slight delays. 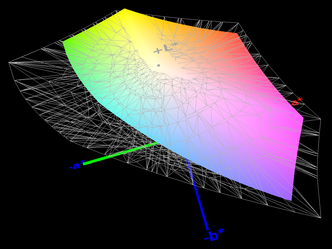 More complex actions, like the use of the brush finger tool, however, can result in significant delays depending on the extent of the modifications. The same applies for cut commands. The CPU runs at 2.37 GHz for the time of the actions and drops back to idle again afterwards (around 0.6 GHz). 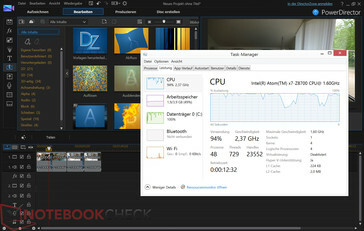 Filters stress the CPU as well and the preview is shown with a delay. The memory workload is at around 64 % of the 4 GB RAM, 1500 MB are only allocated for Photoshop CS5. 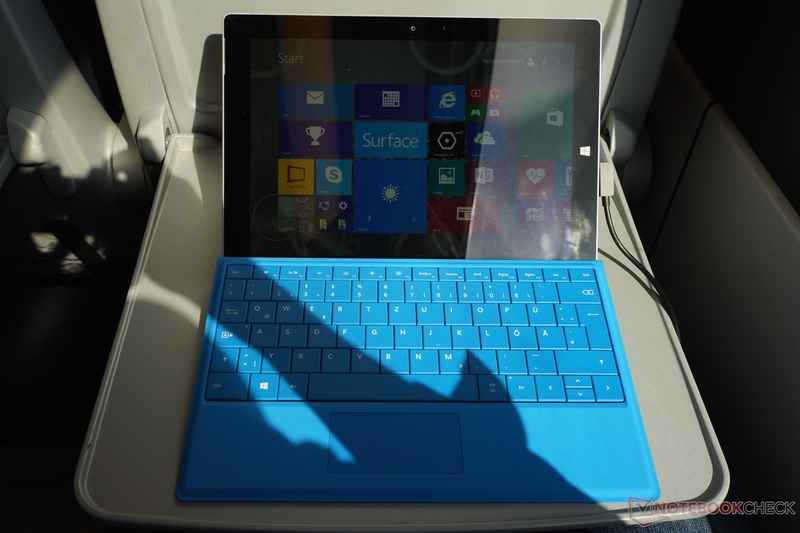 The 2 GB version of the Surface 3 is therefore not suitable for these kind of applications. Adobe Lightroom is another popular tool for picture editing. Similar to Photoshop there are no problems when you open RAW files and with light processing (correcting exposure, contrast,…). The export of the pictures can take a couple of seconds. Still, we would not recommend our tested high-end version of the Surface 3 (128 GB eMMC, 4 GB RAM) for picture editing. If we would express our rating in traffic light colors it would be orange. It will depend on the individual needs of the user and if the provided performance is still sufficient or if the necessary waiting times are too long. Based on our experiences we would not recommend the device for professional picture editing. ... and result in waiting times for the user. Our practical test with Full HD video editing in Powerdirector 13 is not very promising. We imported a one minute MP4 clip (1080p, 50 fps) and cut it or added transitions, respectively. The work with Powerdirector was characterized by input delays, a preview with many stutters as well as unmotivated jumps on the timeline. 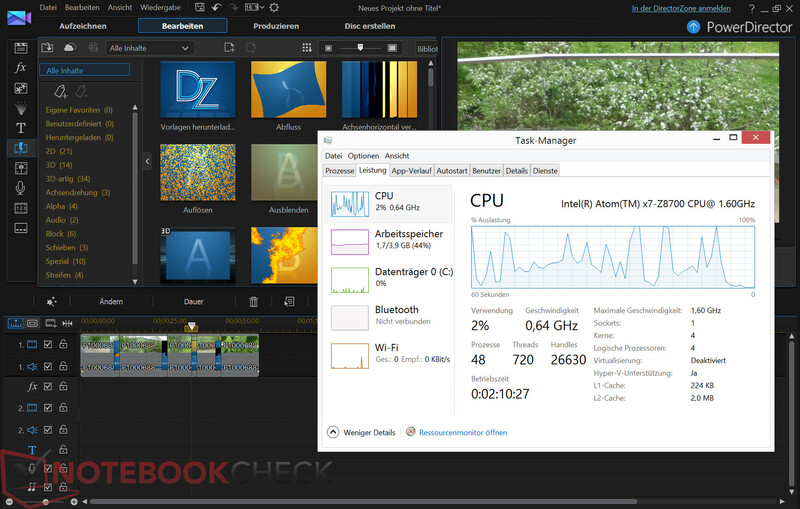 The rendering of the video in H.264 AVC 1920x1080i 60 fps (16 Mbps) was executed in around 3 minutes thanks to the activated Intel QuickSync. 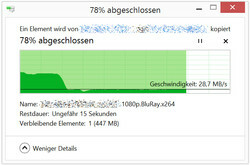 Much smoother was another attempt with a one minute HD clip (MP4, 720p, 25 fps). Cutting, transitions and the preview did not show annoying delays. 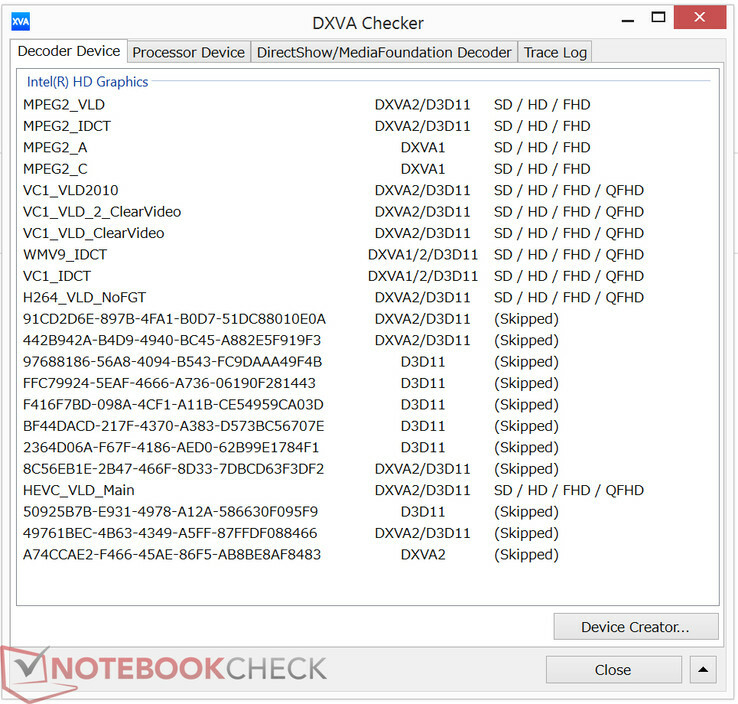 The Intel Atom x7-Z8700 should be able to decode HEVC/H.265 videos, but it seems that the Surface 3 had problems with the high bitrate of this test clip (HEVC 3840x2160, 10-bit). 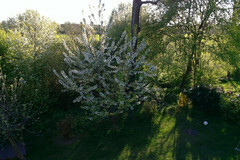 We used the K-Lite Codec Pack 11.04 in combination with the Media Player Classic x64 for this test. 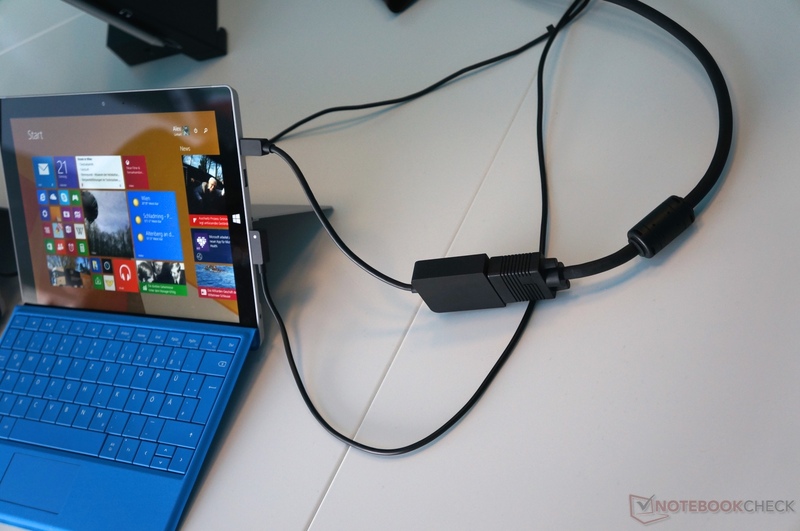 We use an adaptor to attach the Surface 3 to our Asus PB287Q 4K test display (3840x2160 pixels) and check the performance of the video output. 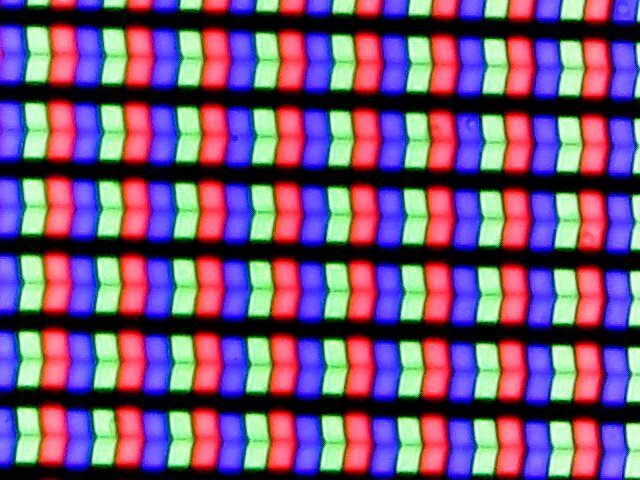 We can quickly see that the picture is only running at 30 fps (DisplayPort 1.1), which is noticeable when you move the cursor, for example, which lacks smoothness and precision. It can also be noticeable when you move windows or scroll through websites. Intel’s Update Utility does not find any drivers right now, which could give us extended settings. Speaking scrolling through websites: The load for the Atom CPU was 100 % when we scrolled in Google’s Chrome browser (output 4K and 1080p). This value is reduced to 50-60 % when you use the preloaded Internet Explorer. 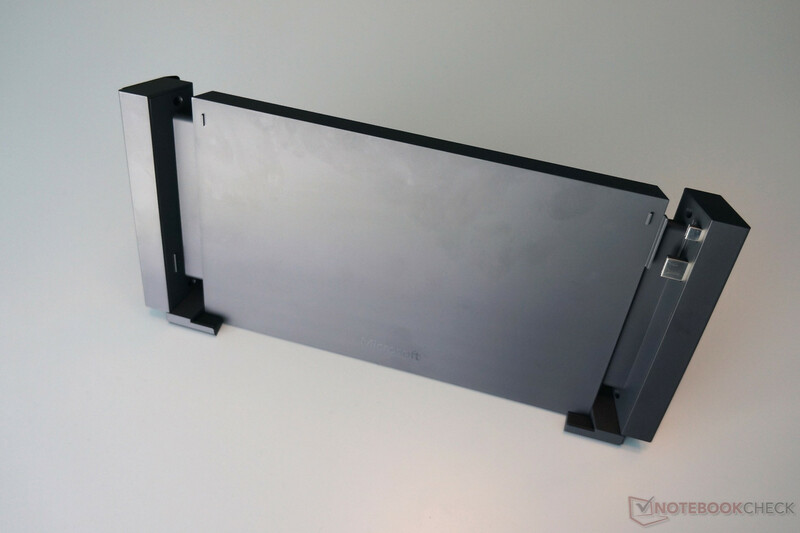 Thanks to a Thermal Design Power of less than 4 Watts, the Intel Atom x7 Z8700 can be cooled passively, so the Surface 3 does not need a fan. 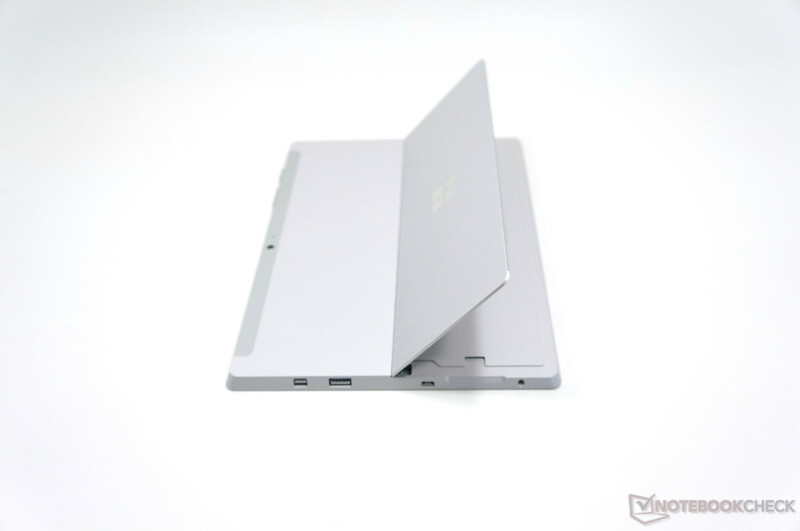 The storage solution does not use mechanical components either, so the Surface 3 is silent in every scenario. We did not notice any other noises during our review period. The x7 Z8700 CPU repeatedly drops below its nominal clock to keep the temperatures in line. The surface temperatures are just slightly higher than 30 °C while idling and therefore no problem. 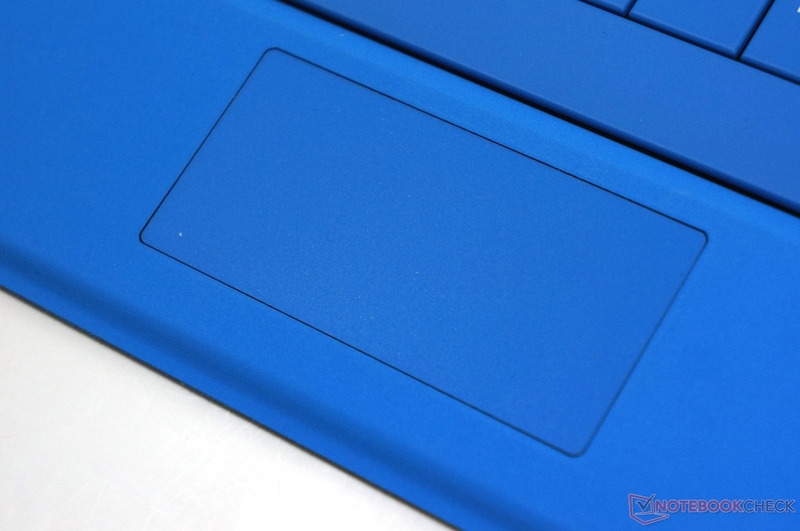 Contrary to conventional notebooks, the display/tablet element of the Surface 3 includes all important components. 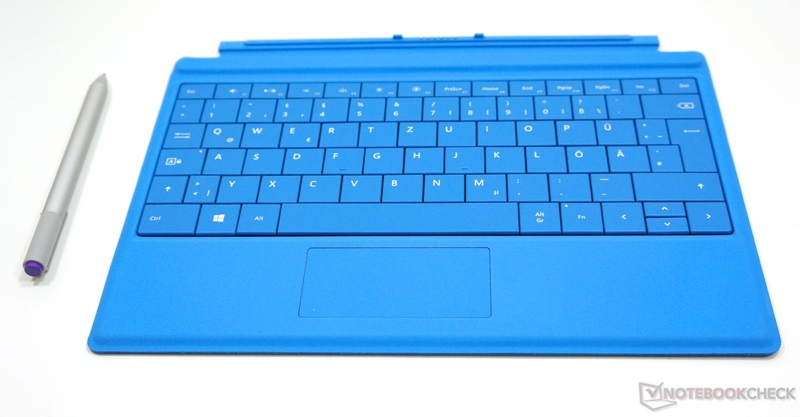 The Type Cover only adds the mechanical keys, but gets the required power from the tablet unit. 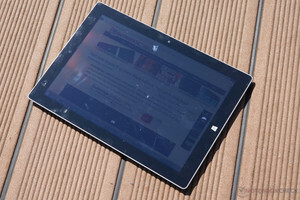 Sustained load will result in higher temperatures that surpass 40 °C, so the warming of the Surface 3 is perceptible but not really an issue, especially if you use the device like a notebook, which seems to be appropriate for more demanding tasks, since there is no skin contact with the display unit. 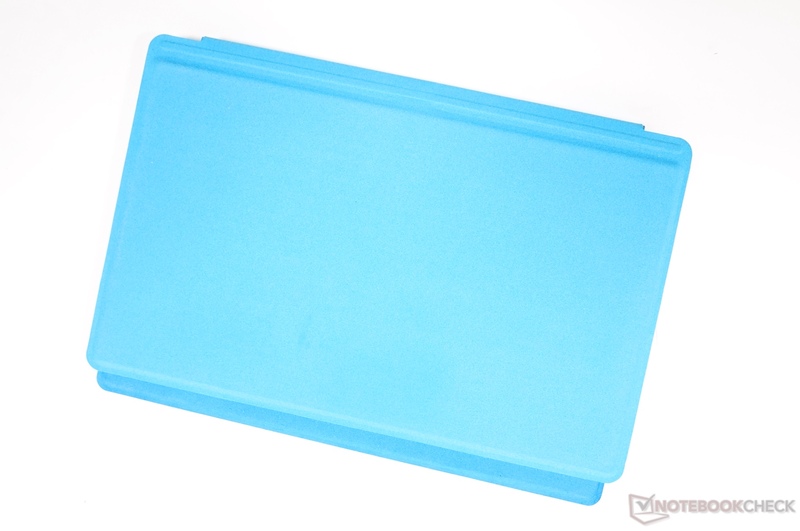 (±) The average temperature for the upper side under maximal load is 37.3 °C / 99 F, compared to the average of 30.3 °C / 87 F for the devices in the class Convertible. (+) The maximum temperature on the upper side is 39.9 °C / 104 F, compared to the average of 35.4 °C / 96 F, ranging from 21.8 to 55.7 °C for the class Convertible. (+) In idle usage, the average temperature for the upper side is 31.9 °C / 89 F, compared to the device average of 30.3 °C / 87 F.
(-) The average temperature of the palmrest area of similar devices was 29 °C / 84.2 F (-8.6 °C / -15.5 F). 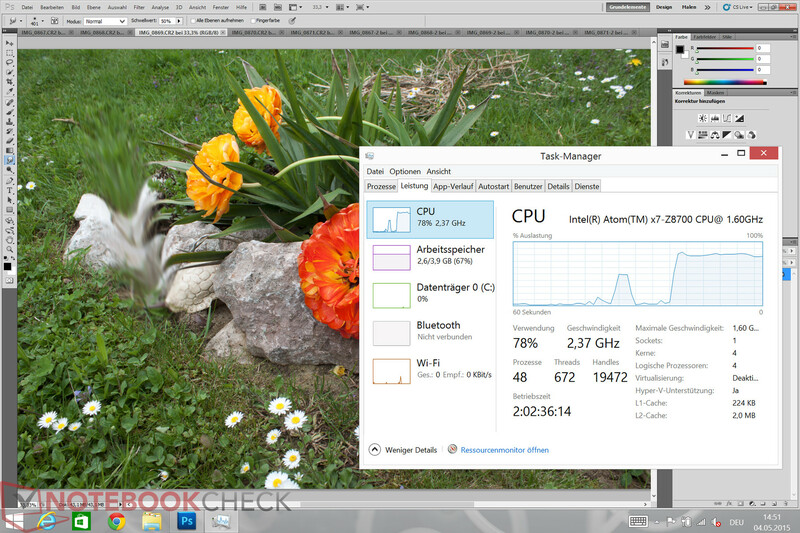 The CPU will start with its maximum clock of 2.4 GHz when we stress it with Prime95, but the clock slowly drops after a few minutes when the temperature reaches around 84 °C and then levels off between 1.4 and 2.0 GHz, while the core temperature of the CPU is between 70-80 °C. If we also start FurMark and stress the integrated HD Graphics (Cherry Trail), the CPU clock will immediately drop to 540 MHz and the system shuts down a couple of seconds later. 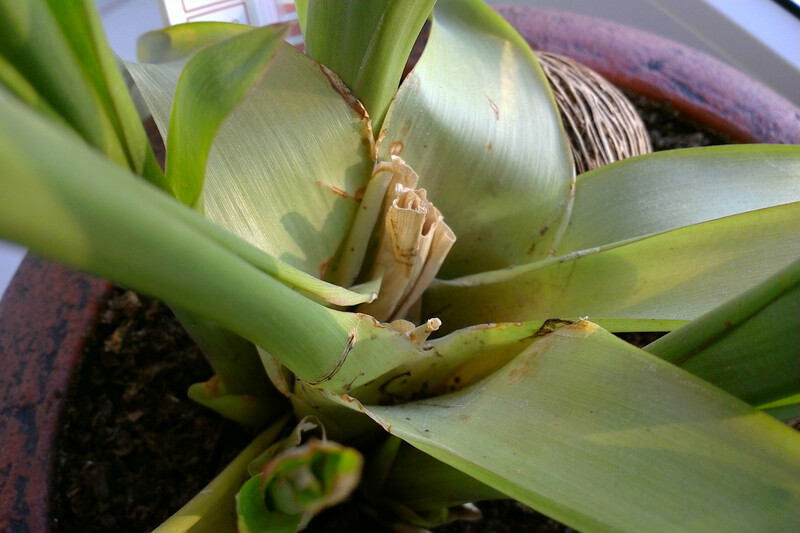 This is probably a safety mechanism to protect the system against damages caused by high temperatures. 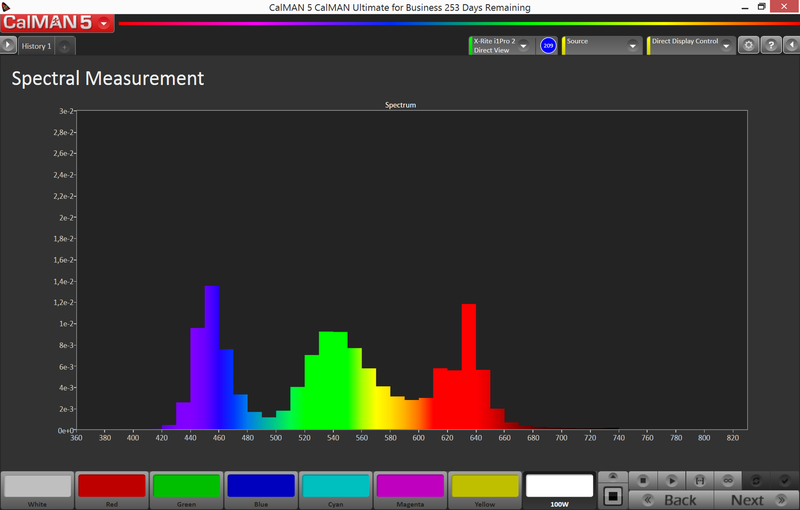 Our stress test measurements therefore only represent the test with Prime95. Microsoft advertises a runtime of around 10 hours. Our first observations suggest a runtime between 6-7 hours in our WLAN test and around 7.5 hours with a 720p video clip (x264) at the maximum brightness setting. 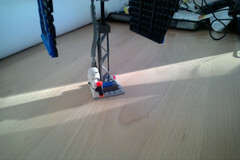 We will, however, have to wait for our final measurements before we can see a definite result. The provided power adaptor is rated at 13 Watts and is supposed to charge the device in around two hours according to the manufacturer. The battery has a capacity of 28.4 Wh. After the completion of our measurements we can complement the official information from Microsoft. Our Reader's Test (reading of a text file) with the minimum display brightness and deactivated wireless modules determined a maximum runtime of more than 13 hours. Our script in the WLAN browsing test (v1.3) ran for more than 7 hours with an adjusted brightness (177 cd/m², maximum brightness minus 4 steps). 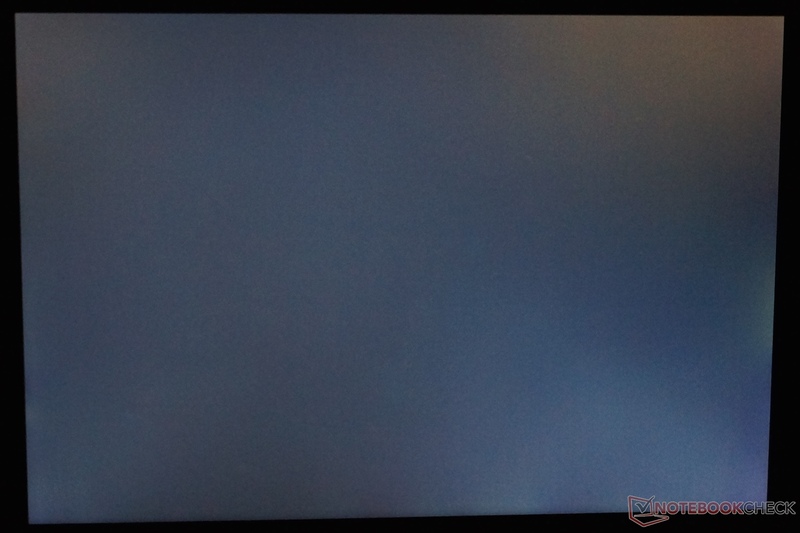 The Surface 3 was empty after around 3 hours under load (Classic test). 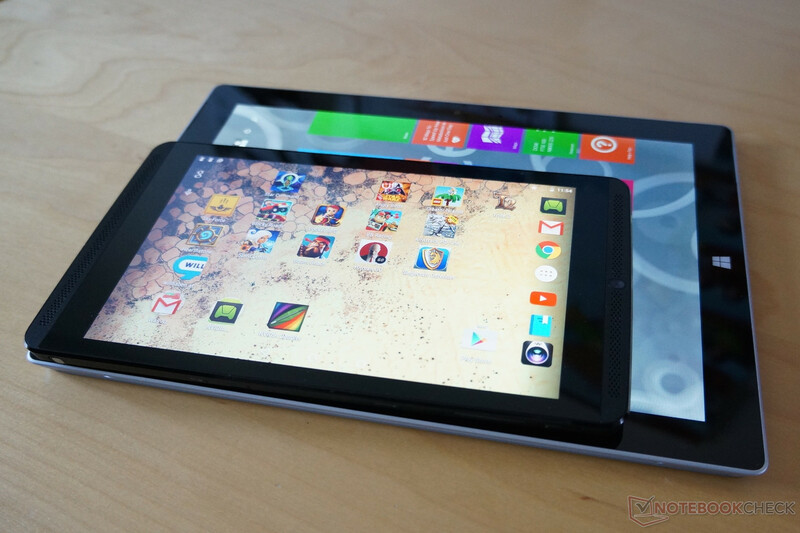 These runtimes are okay for a device that is mainly designed for simple tasks and web browsing, and the same applies for the comparison with other convertibles. 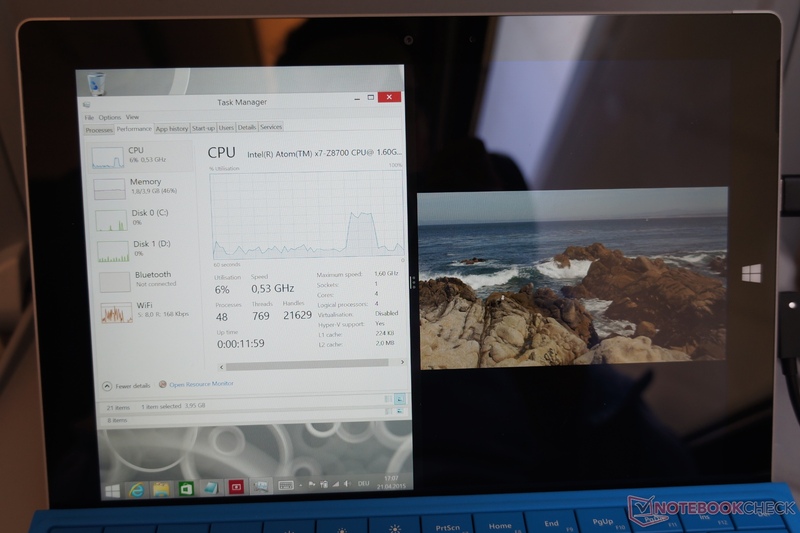 Despite the more powerful CPU, the Surface Pro 3 manages better results in the idle test, but falls behind under load. The Aspire Switch 10 (Atom Z3735F) reaches similar runtimes in the practical WLAN test, despite the smaller battery. "Mobile employees" in particular are the target audience for the Surface 3 according to Microsoft. 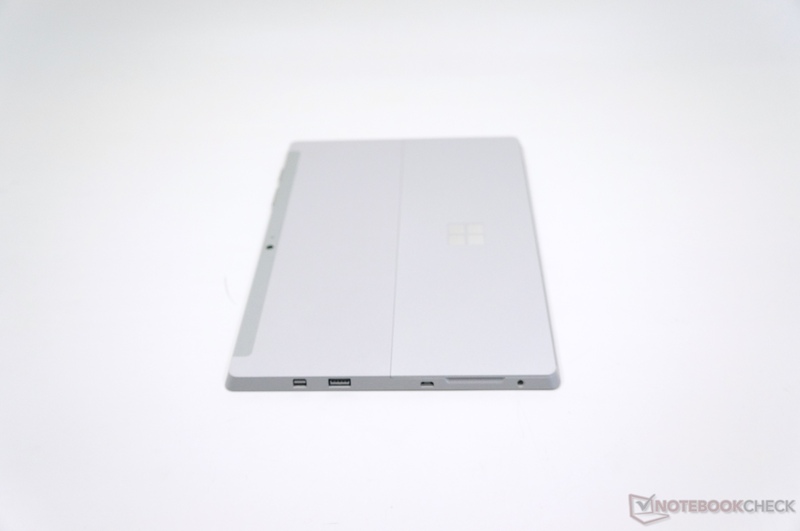 For us, this means a frequent switching between battery and mains operation, depending on the environment when you use the Surface 3 on the road. 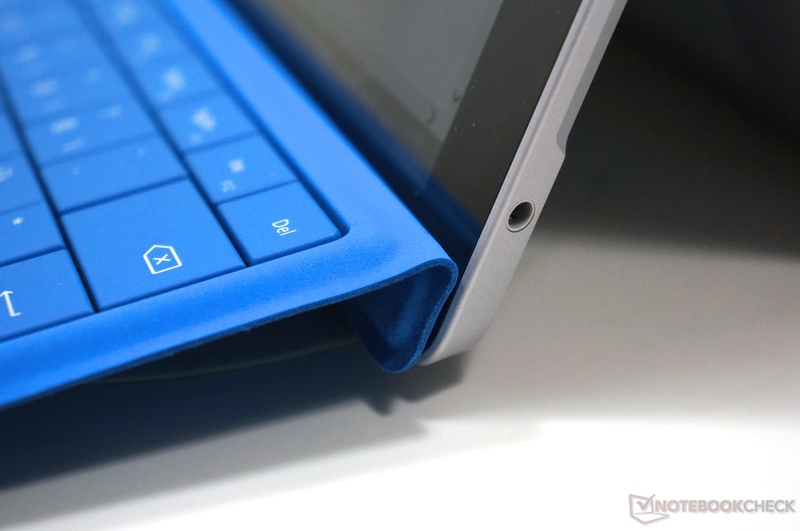 And this might actually be the biggest issue of the Surface 3. The poor charging times disqualify the device as an ultramobile working device. 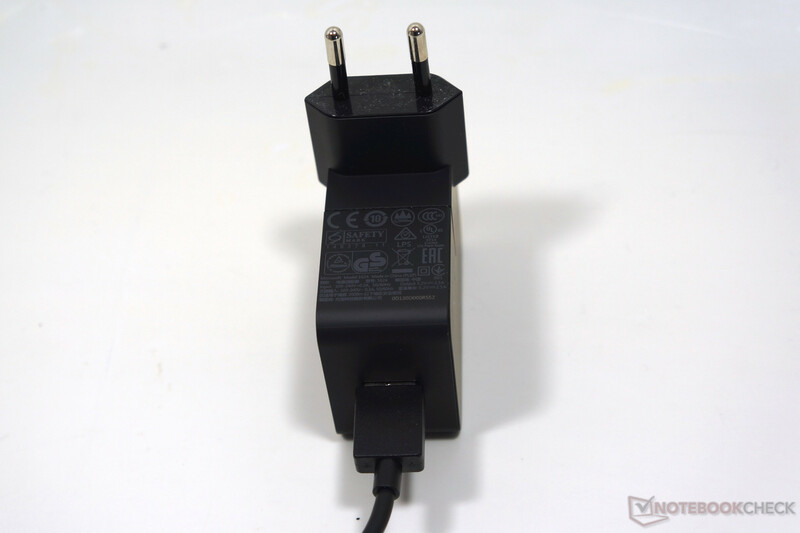 If you charge the device when it is turned off, the 13-Watt power adapter charges the battery by 32% (start at 5% remaining capacity) within one hour. After two hours we get 72 %, but the whole capacity of 28 Wh is only available after almost 4 hours. If you have to use the device while you charge it, however, on the train or a plane, for example, then it takes much longer. It seems that the 13-Watt power adapter is not powerful enough. We simulate the use with the help of our WLAN script and charge the battery at the same time. After one hour (once again start at 5 % remaining capacity) the battery capacity is only at 18%, after 2 hours 27%, 3h: 39%, 4h: 53%, 5h: 67%, 6h: 80%, 7h: 92%, and the full capacity is only available after around 8 hours. 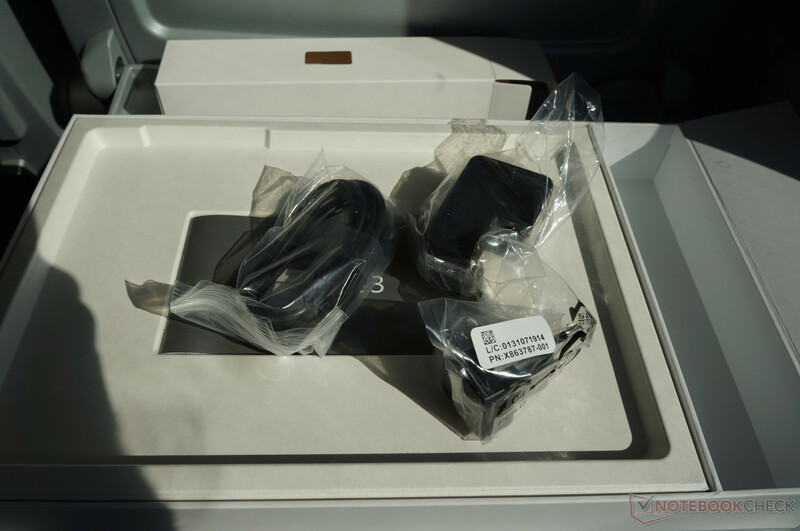 In our test with multiple days of flights and numerous location changes we always had the problem that the device did not get enough power in the charging periods to use the device without a socket afterwards for a longer time. 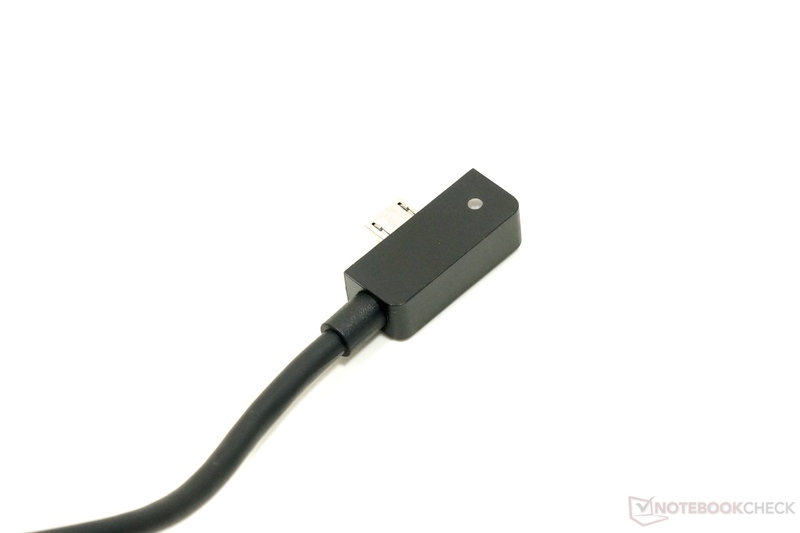 The cable of the provided power adapter can also be used as a USB cable. 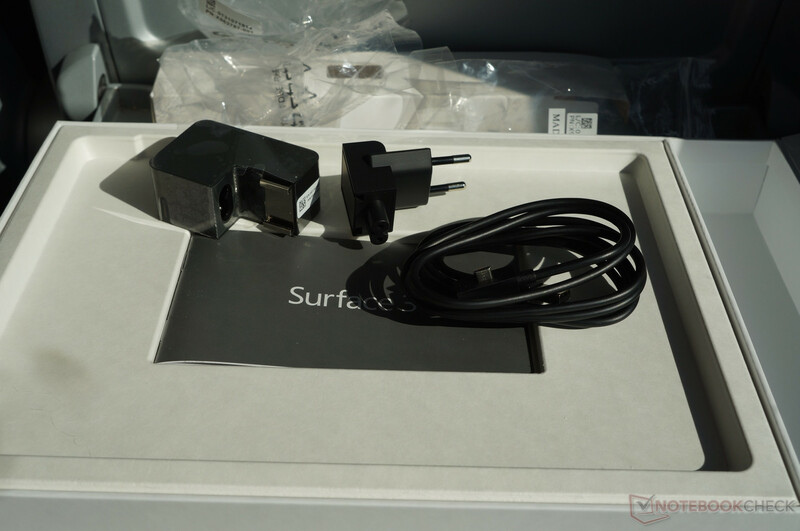 The charging via USB port is basically possible, but only when the Surface 3 is turned off, otherwise the device will consume too much power so it would take quite a while. 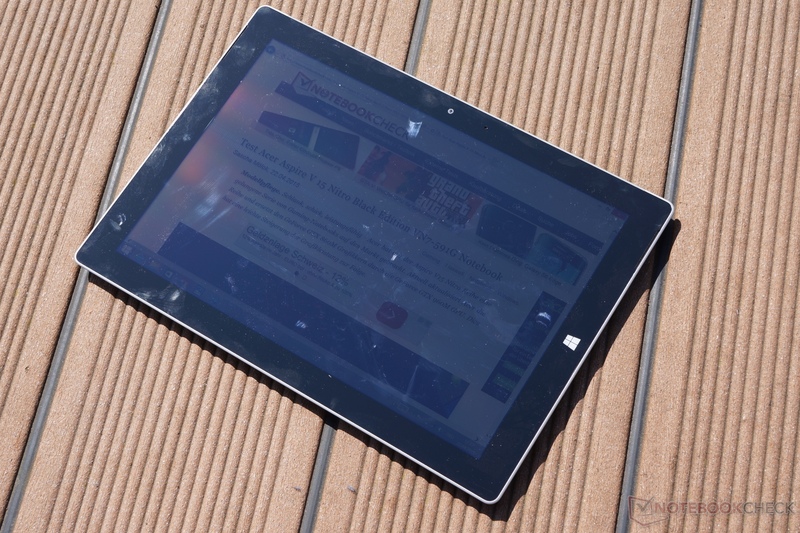 We have a look at the power consumption of the Surface 3. While idling, we can measure a consumption between around 3 and 8.5 Watts, and up to 12 Watts under load. 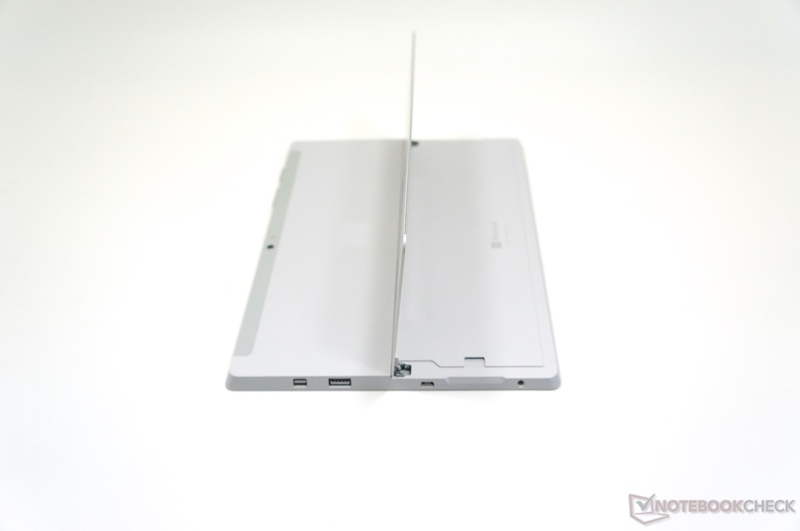 The Aspire Switch 10 with the Atom predecessor Z3735F is more frugal with 2.2 up to 5.5 Watts. Devices with the new Broadwell-Y processor, like the Dell Venue 11 Pro or the Lenovo Thinkpad Helix 2 (each 2 up to 6.2/6.6 Watts) cover a wider range in respect of the idle consumption. 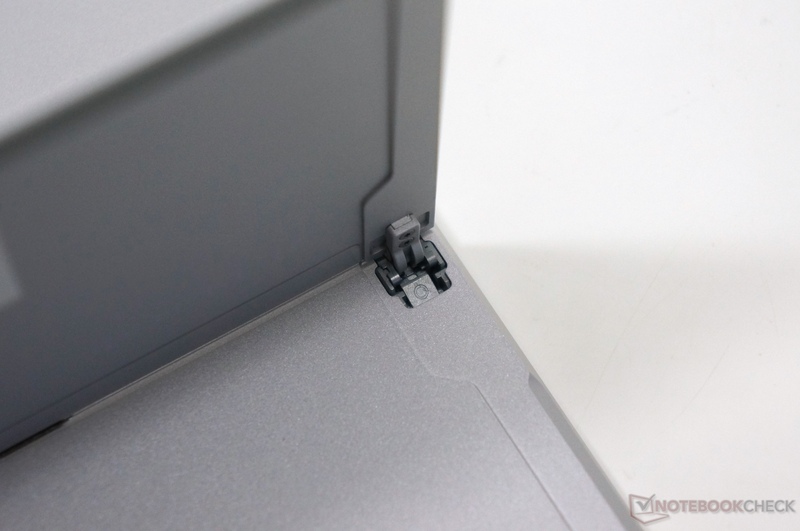 Broadwell-U in the Thinkpad Yoga 12 needs 3.6 up to 9 Watts and up to 35.7 Watts under load. 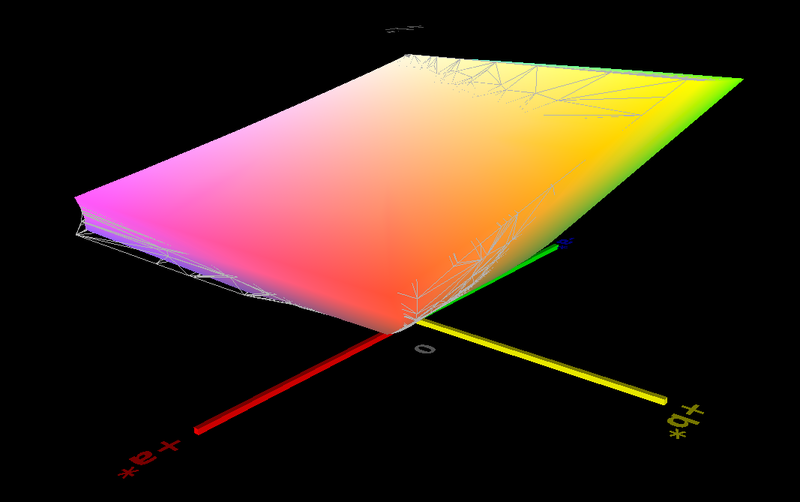 We can measure a consumption (at the socket) of 3 up to 6 Watts (reduced brightness at 177 cd/m²) in the WLAN test. 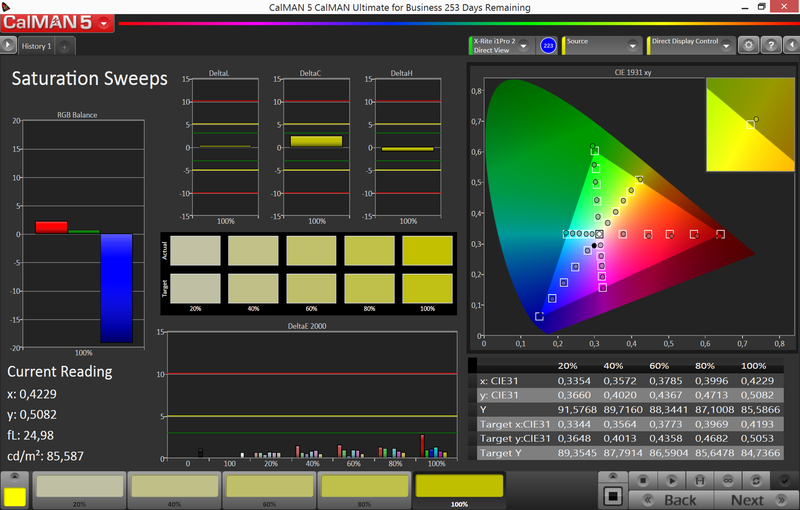 The display brightness has the biggest impact on the runtimes, a reduction of four steps to 177 cd/m², for example, can reduce the power consumption from 7.0 to around 4.7 Watts. 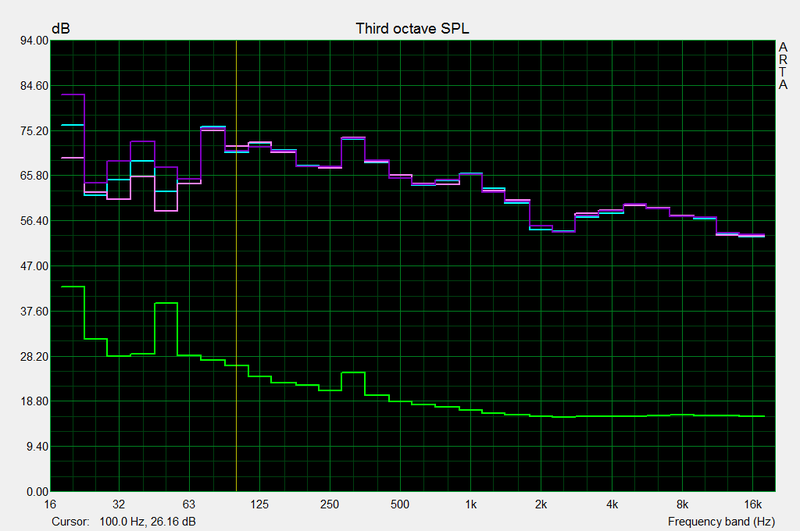 The power consumption during standby is also suspicious in our measurements. We can measure 2 up to 5 Watts. One reason for these peaks could be Microsoft's Connected Standby, which enables updates for apps of the modern UI despite the standby. Those updates include the weather and mails, for example. 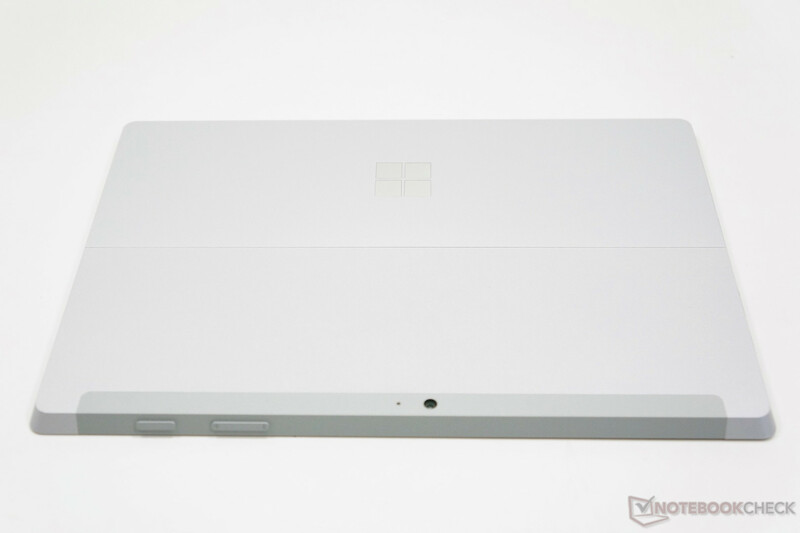 After we put the Surface 3 to standby and activated it 16 hours later we were able to see a reduction of the battery charge from 100 % to 95 %. However, the device did not resume from standby but rebooted. It seems that the device turns off automatically after a certain period. 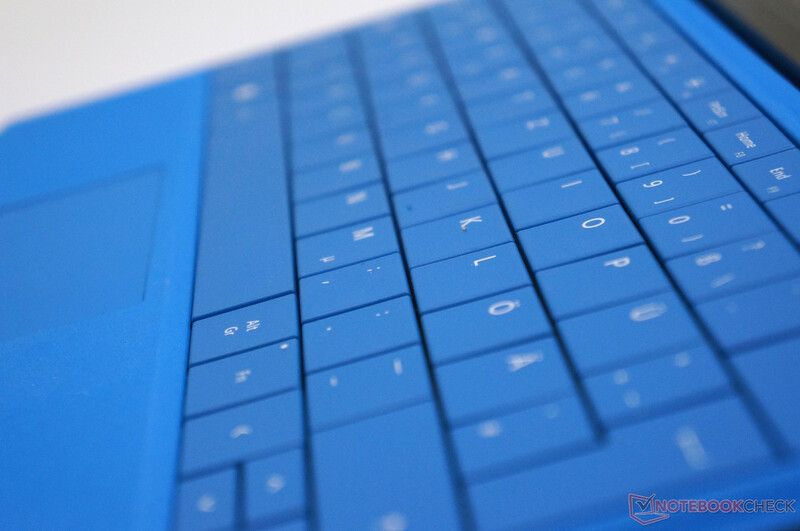 Surface 3: Job done right? 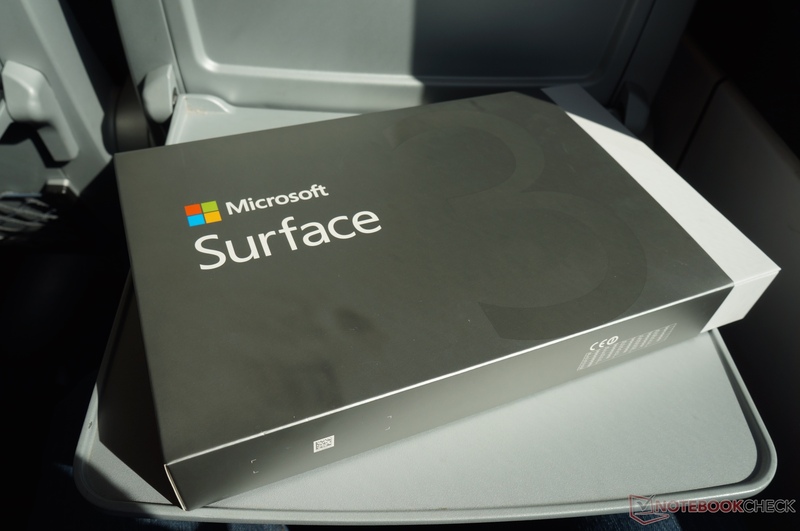 We already mentioned that the Microsoft Surface 3 is a convenient package, which does not reveal any serious issues at a first look. Chassis and build quality are on the good level of the predecessor, the Type Cover can actually be used for longer texts, the display convinces with a good luminance as well as accurate colors and the new 3:2 aspect ratio can be a small advantage for productivity. The performance seems to be sufficient as well. 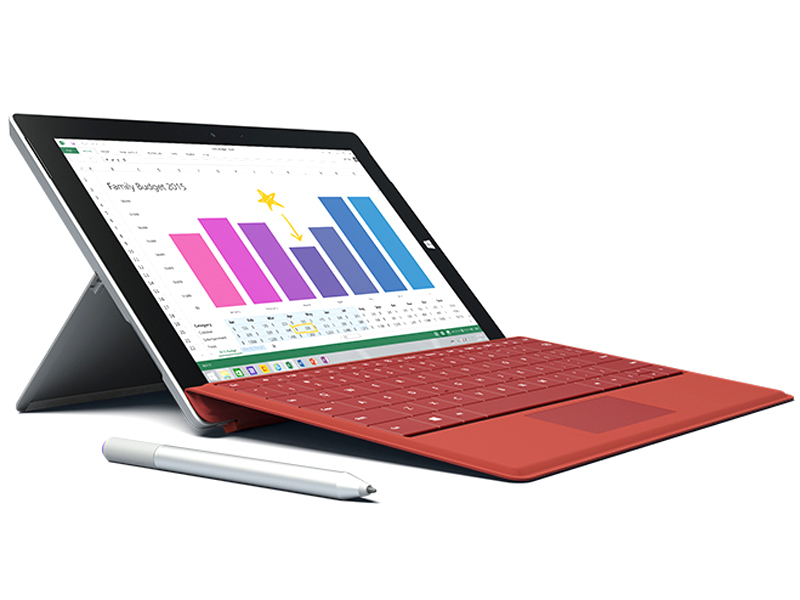 The Surface 3 closes the gap between a tablet and a notebook like we have never seen before. 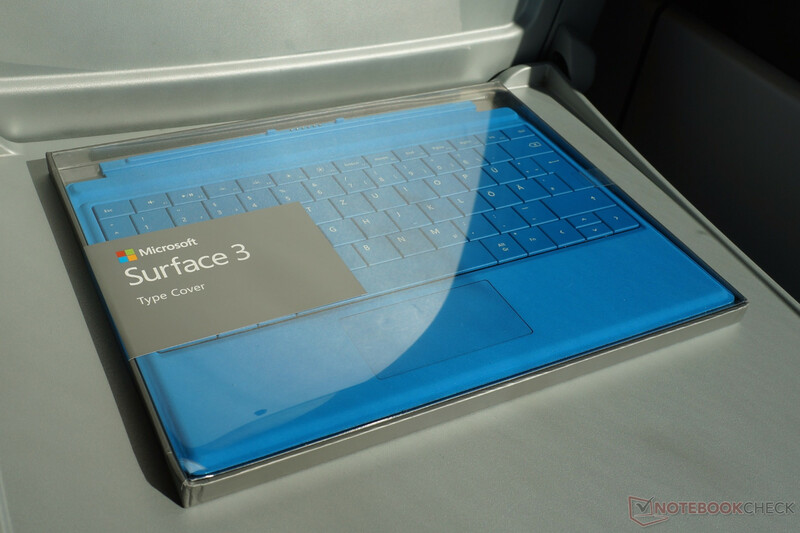 We are eager to follow the journey of Surface products over the next couple of years. Update 05/02/2015: As expected, the analysis of the storage solution (eMMC) reveals big issues compared to conventional SSD drives. This is mainly noticeable when you copy files, but also when you open and save files within applications. 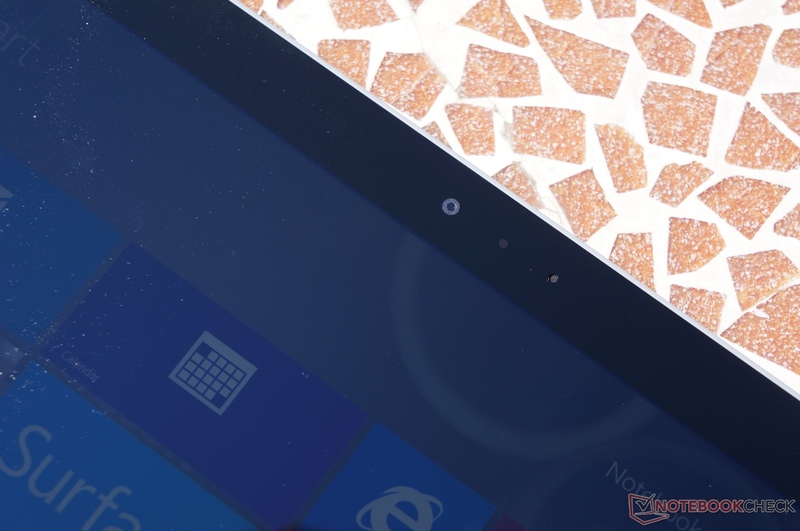 The determined battery runtimes of the Surface 3 are good and reach more than 7 hours in our WLAN test. 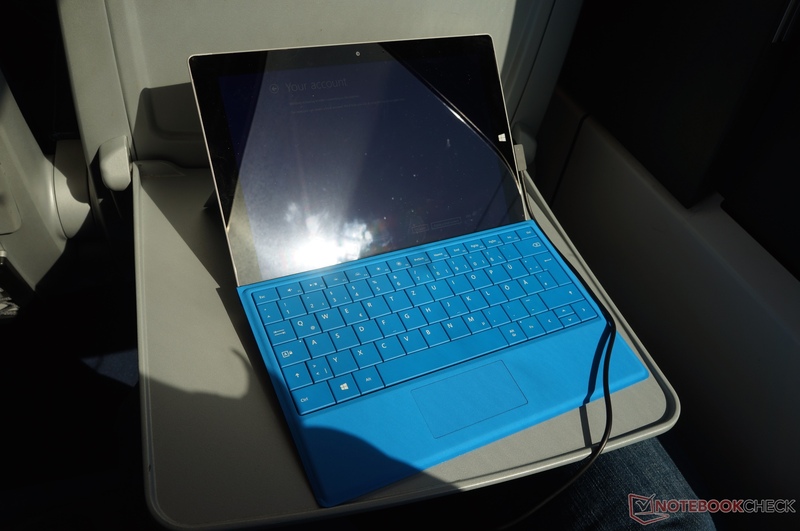 The drawback of the Surface 3, however, is the charging time. You cannot use the device if you want to fully charge the battery within 3-4 hours. 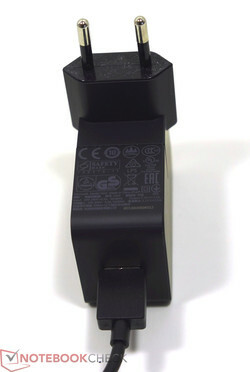 If you use the device, you can expect charging times of up to 8 hours when the battery is empty. This resulted in pretty big problems when we tested the device on the road. Update 05/07/2015: After comprehensive tests, the Surface 3 acts like a good working device for common tasks like web browsing, office applications and the playback of audio and video files. 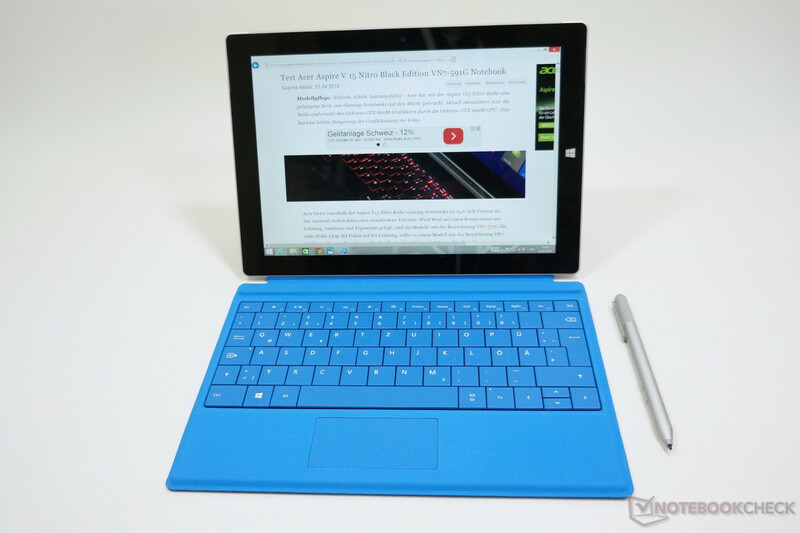 Even picture and movie editing is, if you use simple tools, actually possible with the Surface 3. Our verdict is generally positive with an overall rating of 85 %. The Surface 3 is well-suited as a notebook-tablet hybrid, but a comparatively high price for the package with the Type Cover unfortunately prevents a purchase recommendation.